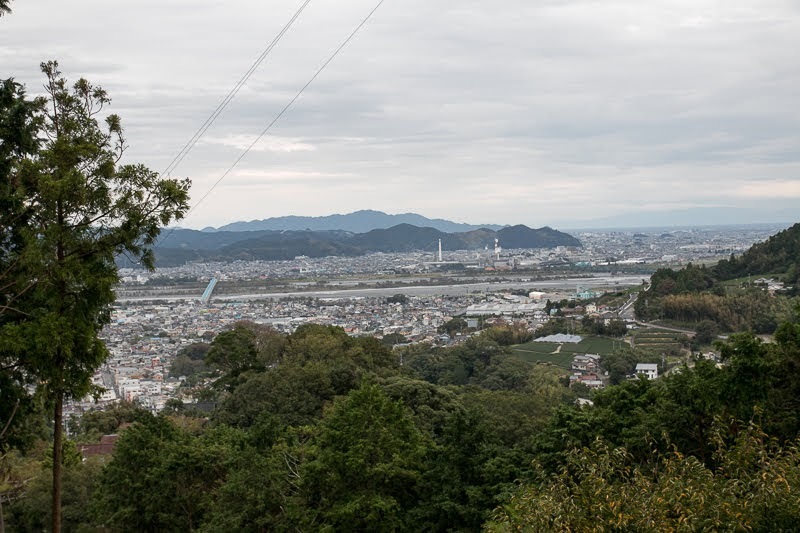 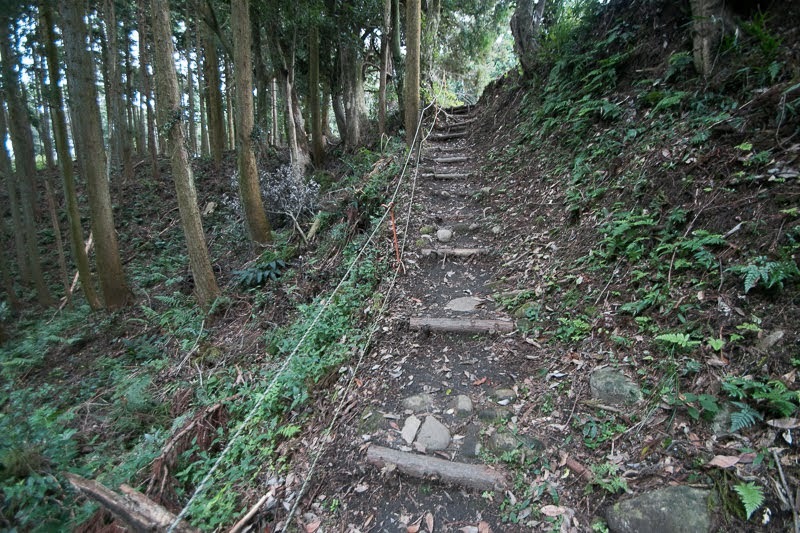 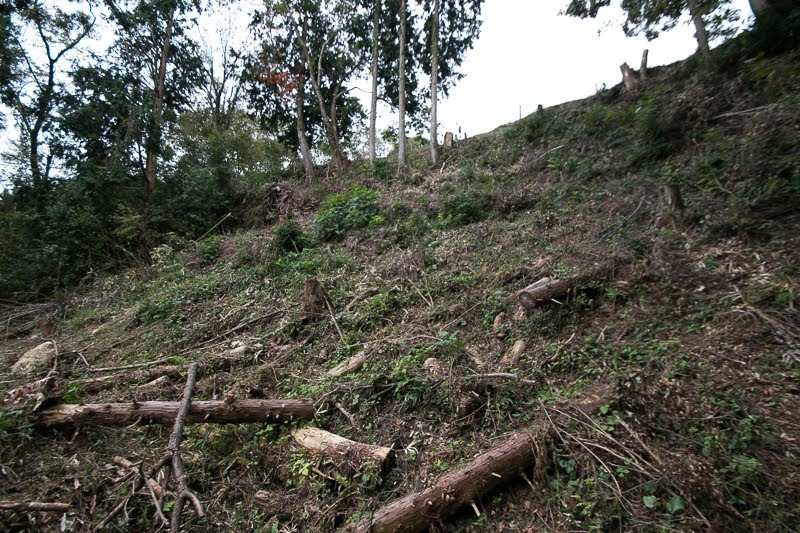 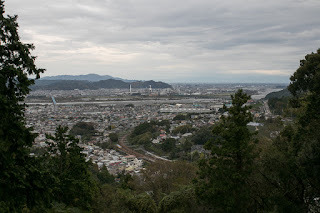 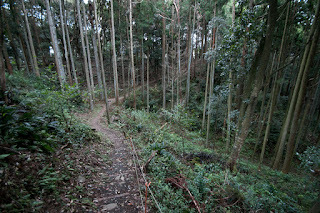 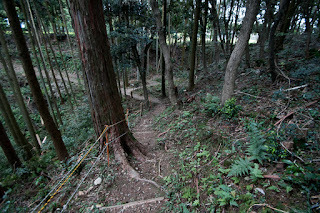 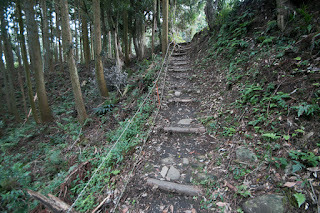 Suwahara castle (諏訪原城) is located at the edge of the cliff where Makinohara height meets Oigawa river in Kanaya city. 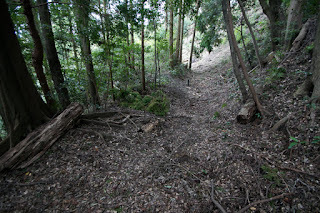 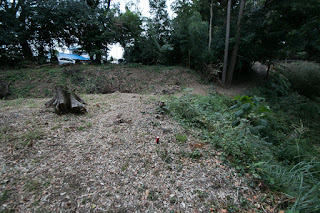 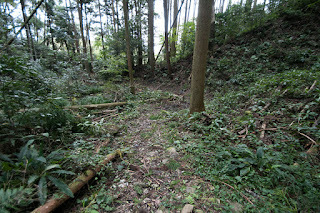 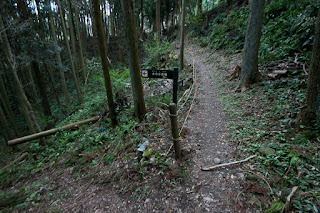 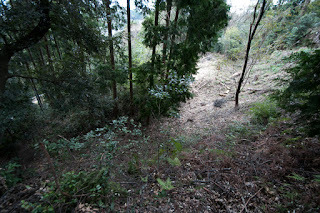 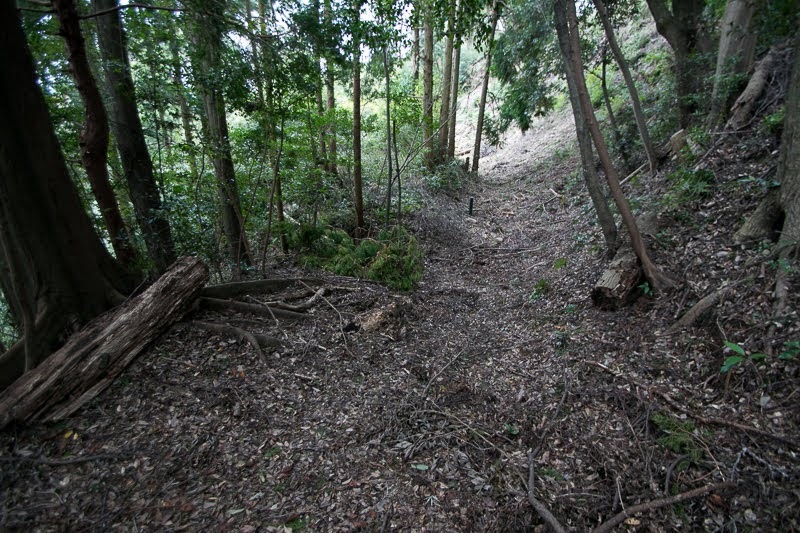 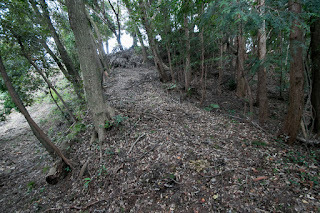 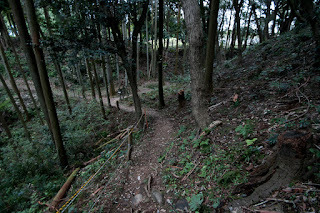 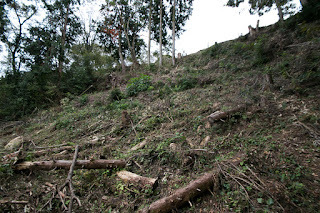 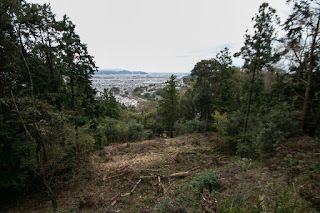 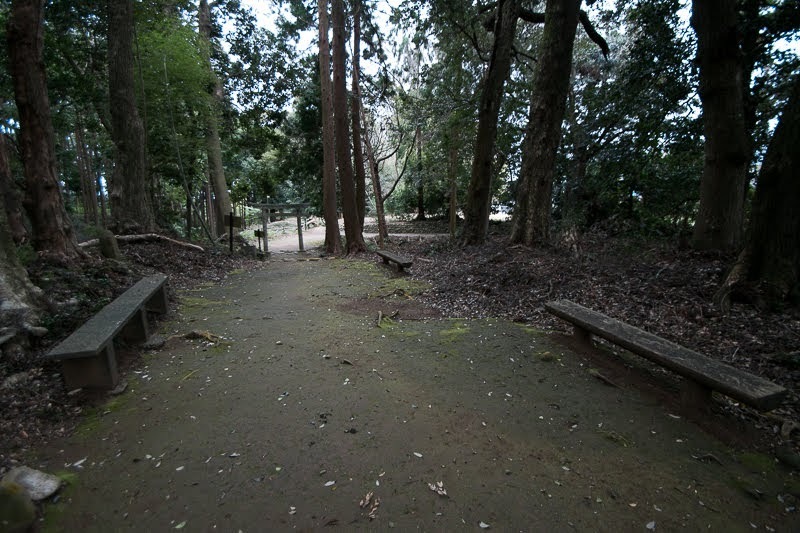 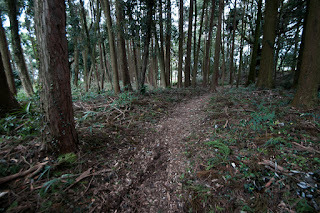 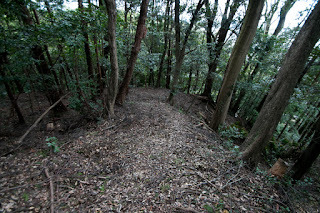 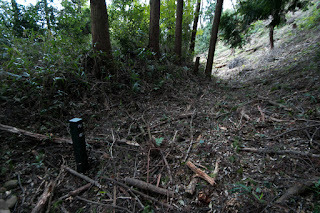 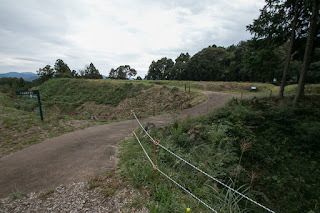 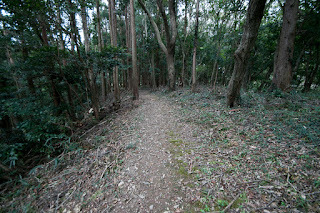 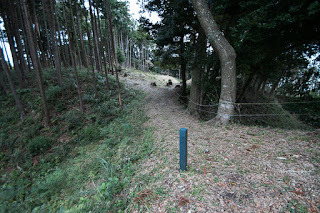 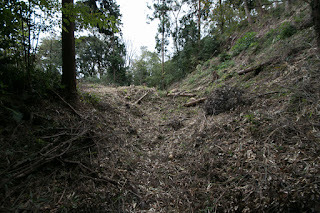 This area is a crossing point of Tokaido road for Oigawa river, and in old time Oigawa river run through more closer to the cliff compared with now. 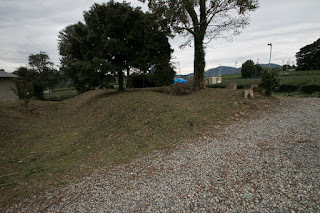 Thus the site of the castle was an important point of land transportation and river transportation. 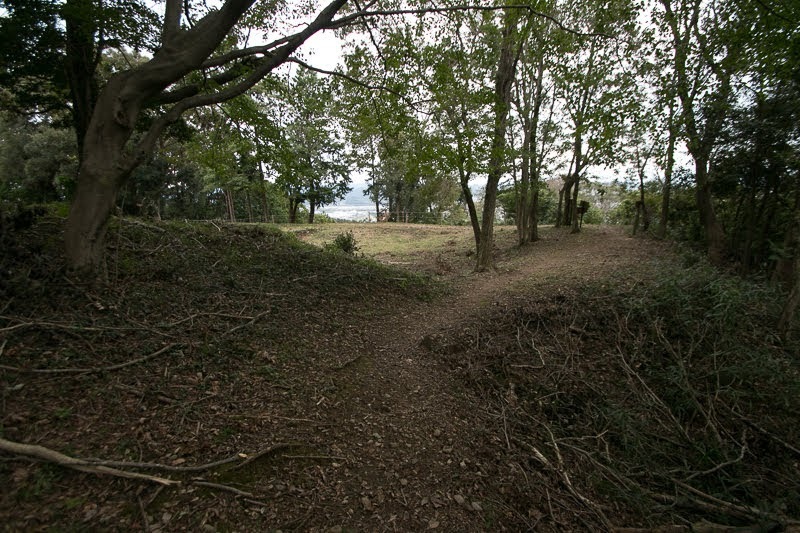 Suwahara castle was built by Takeda clan in 1573, as a bridgehead to Totomi province (western part of Shizuoka prefecture) which was held by Ieyasu Tokugawa (1543-1616). 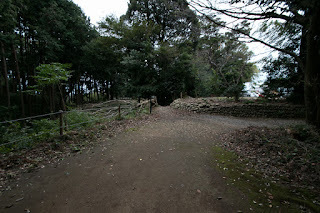 Katsuyori Takeda (1546-1582), the leader of Takeda clan, ordered his famous general Nobuhafu Baba (1515-1575) to plan and construct a castle at this place. 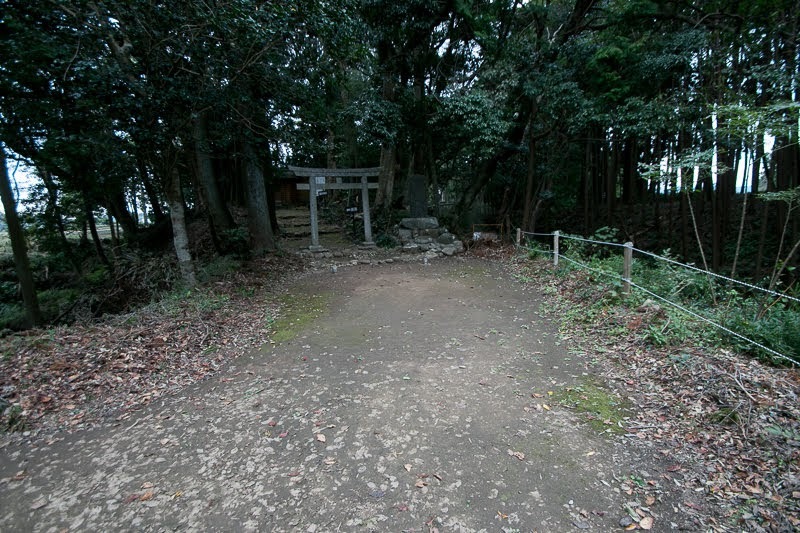 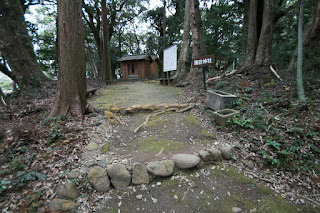 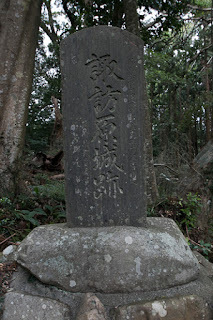 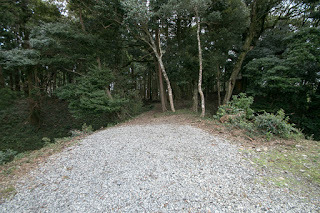 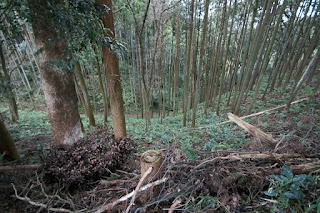 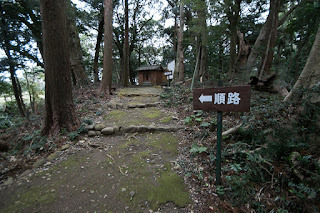 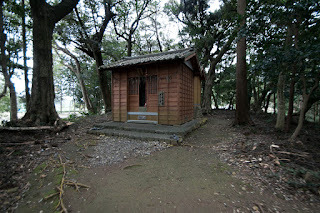 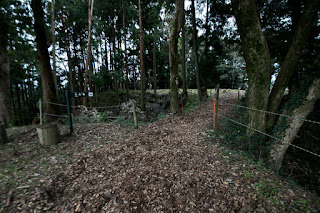 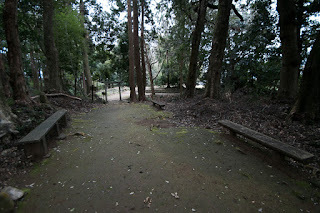 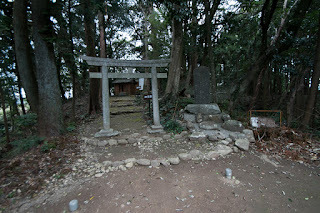 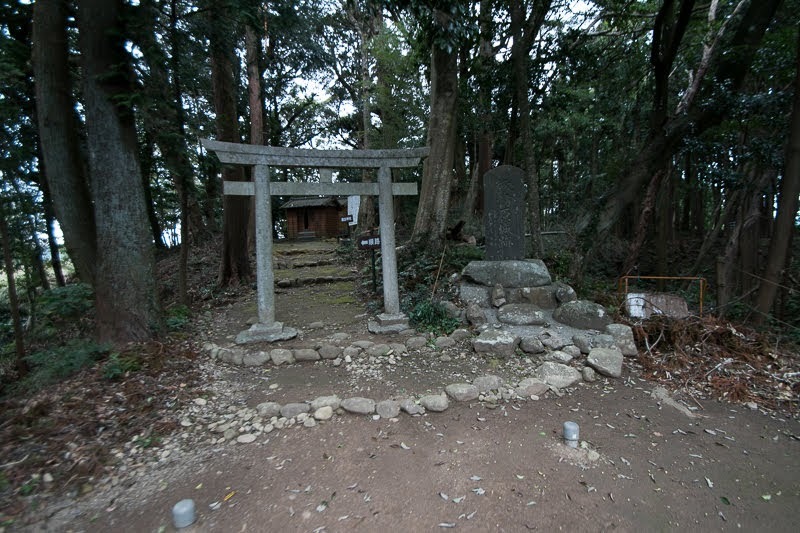 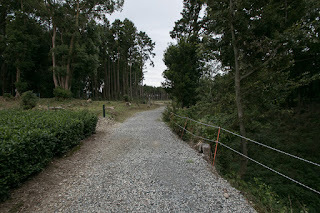 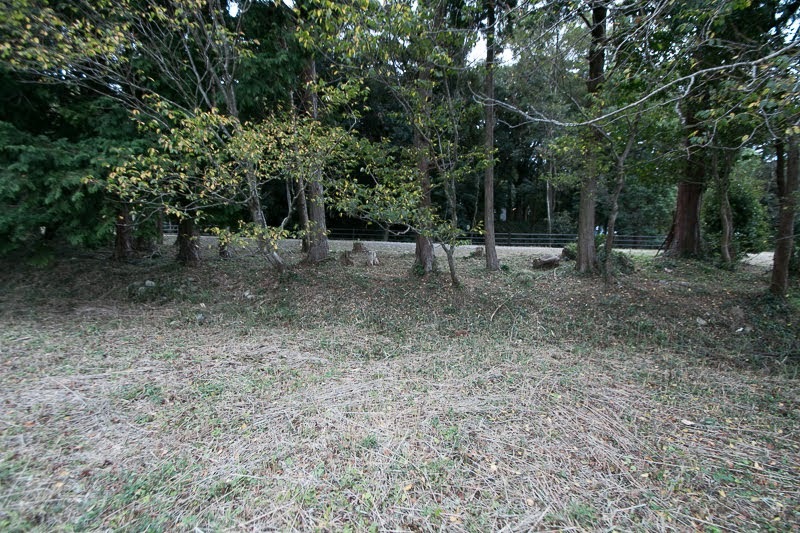 Completed castle was named as Suwahara castle, owing to the Suwa shrine brought to here, a guardian god of Takeda clan. 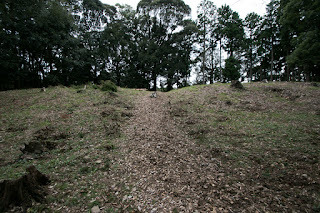 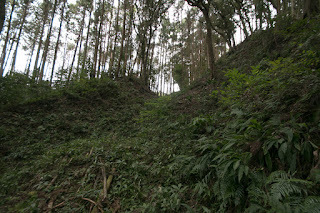 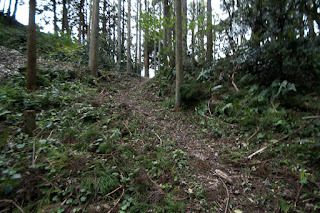 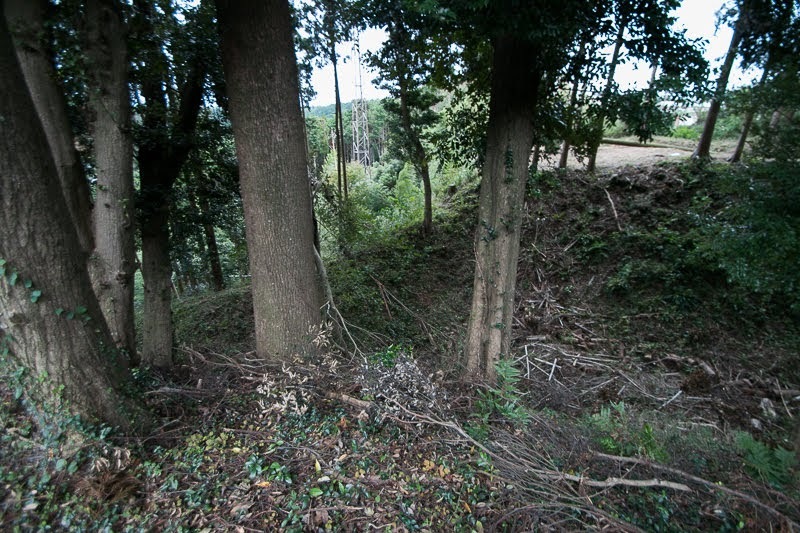 The backside of the castle was a steep cliff and there was little possibility of assault, thus the castle had to defend mainly its front side. 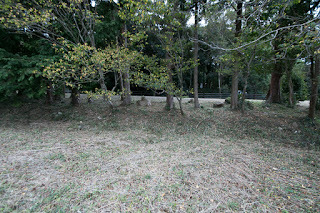 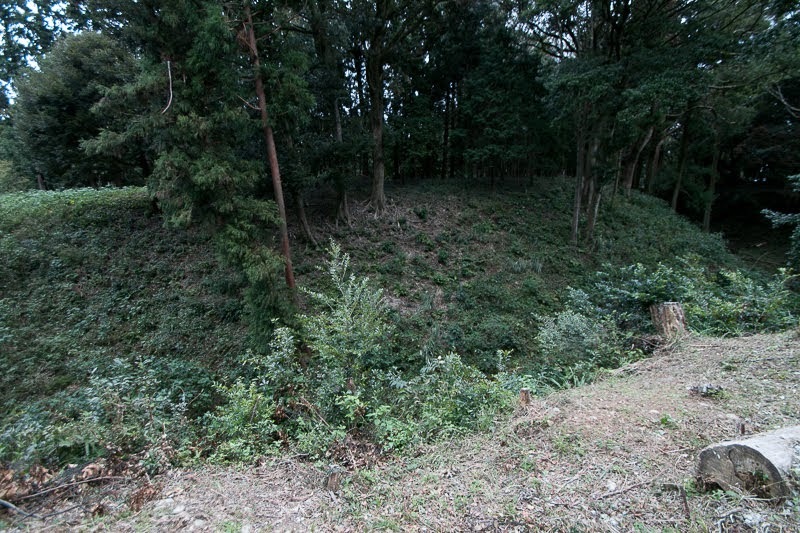 The front line of the castle spread in shape concentrate circle from central area, thus this castle is called as folding fan castle. 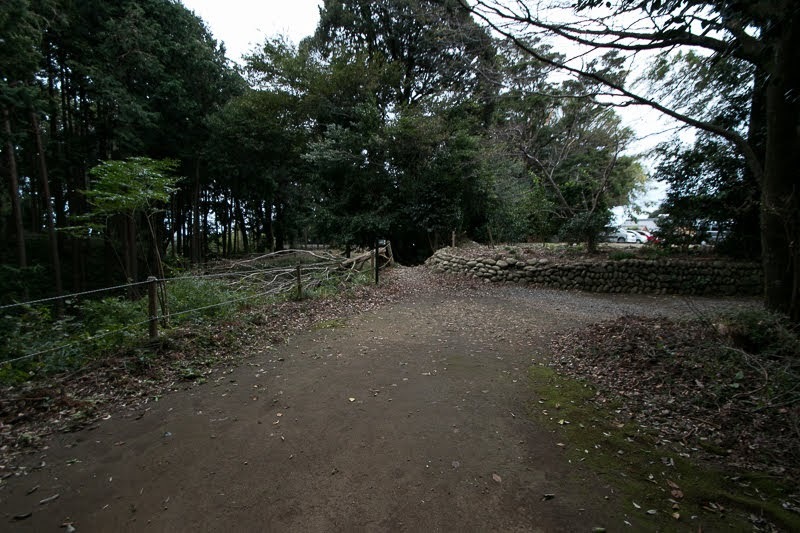 Central area of the castle is about 100 meter long square shaped area, which might have the residence of the lord. 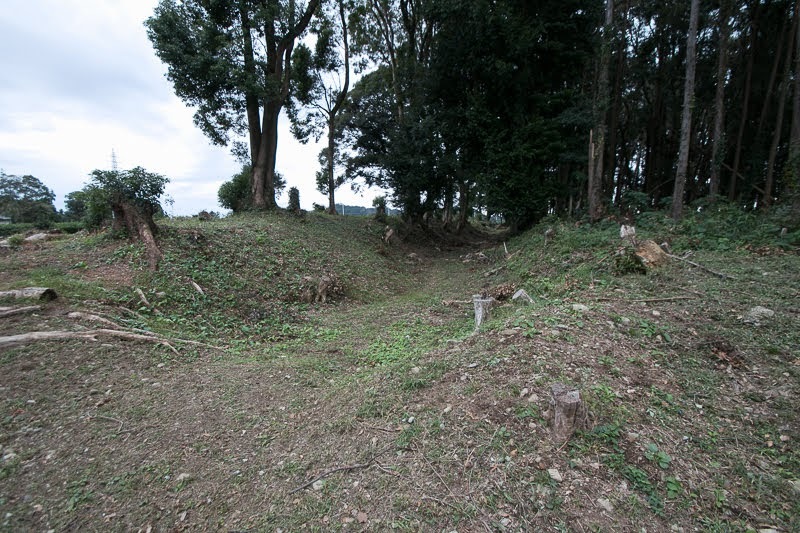 Outside of central area, there are secondary area and third area between inner moat and outer moat, which is separated by line of clay wall. 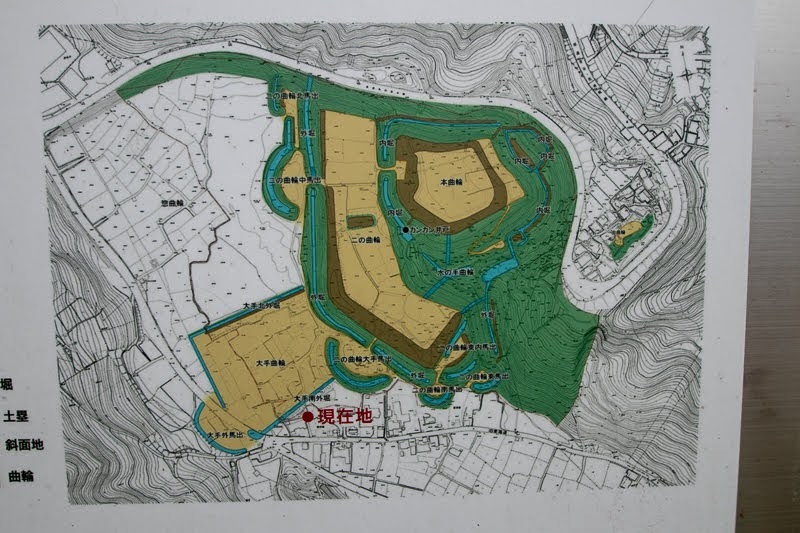 Secondary area is about 100 meter long and 80 meter wide flat area, and third area is about 200 meter long and 80 meter wide flat one. 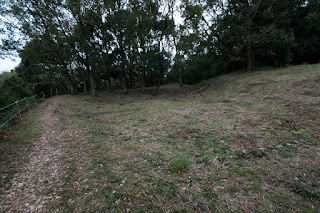 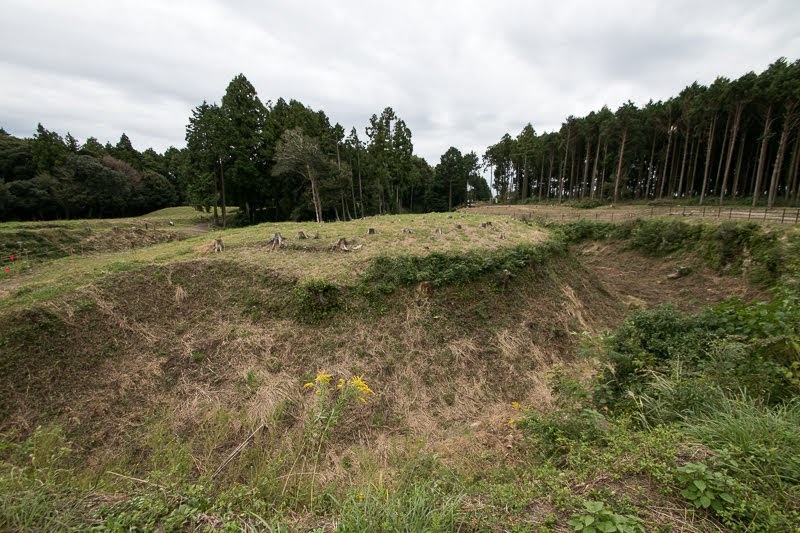 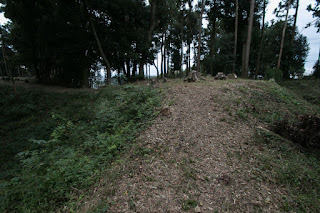 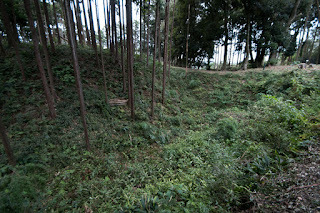 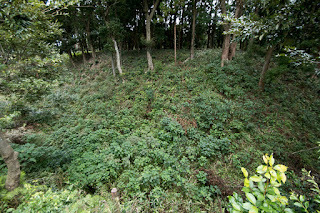 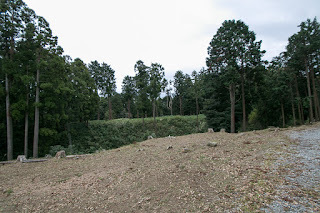 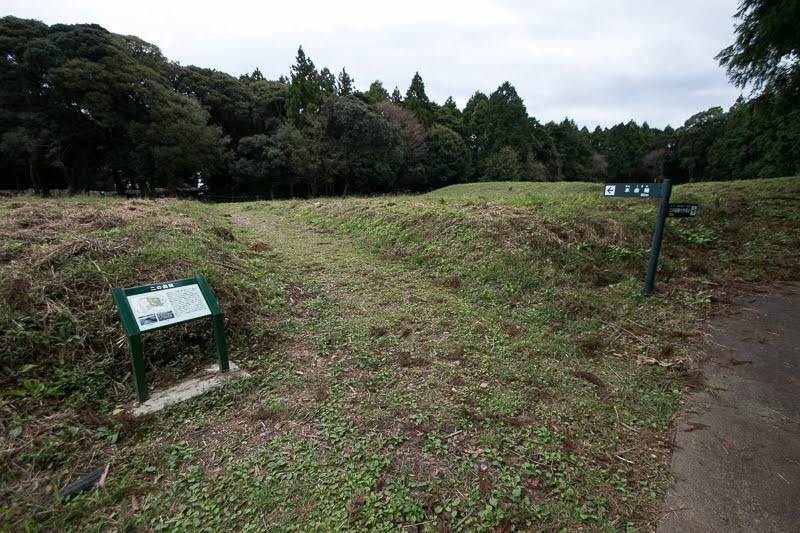 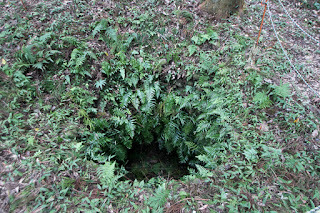 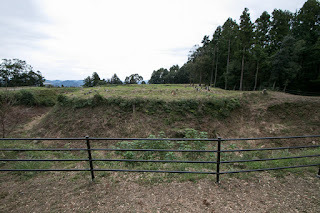 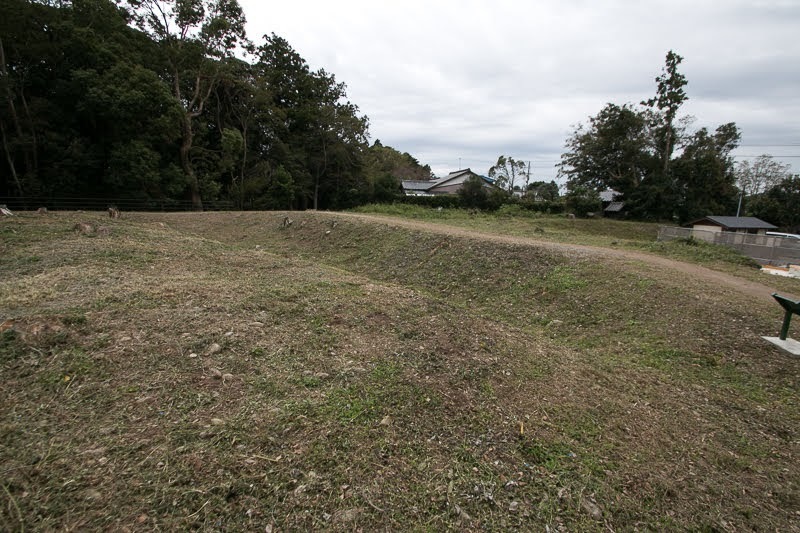 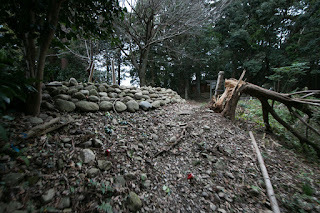 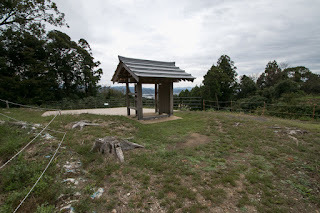 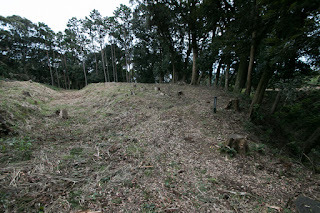 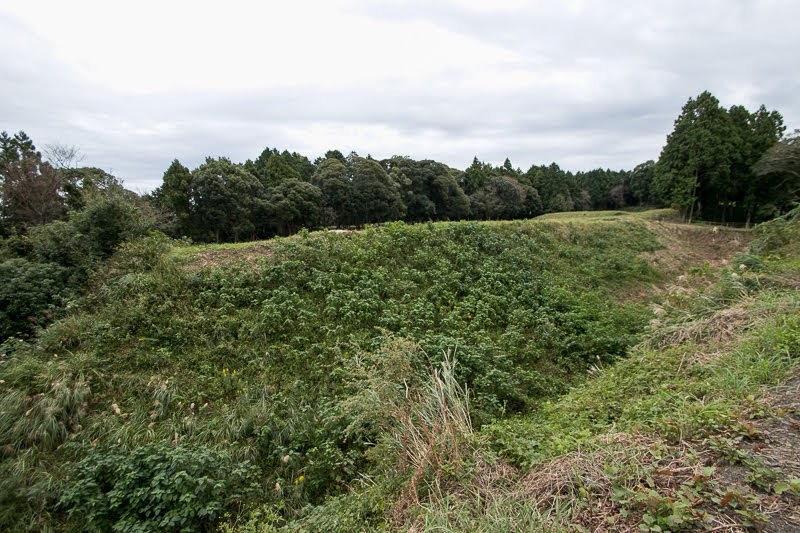 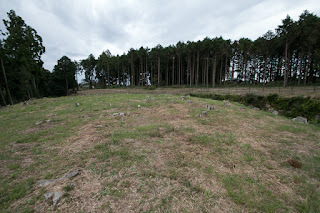 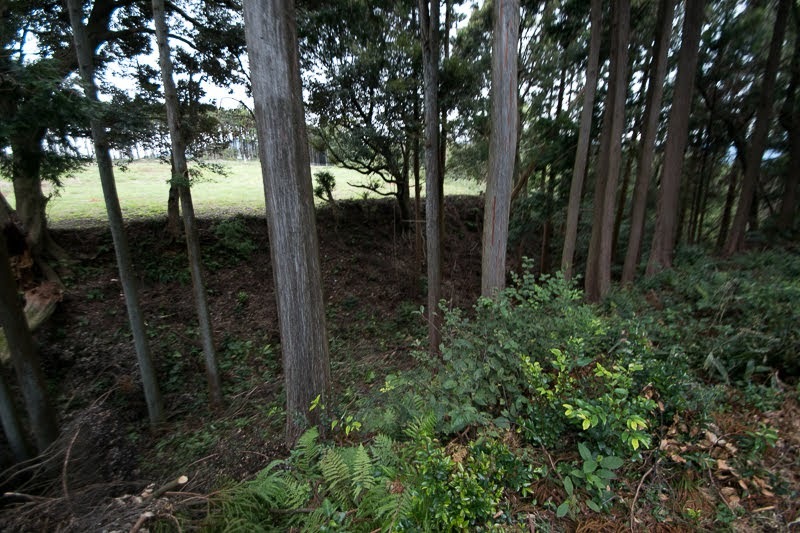 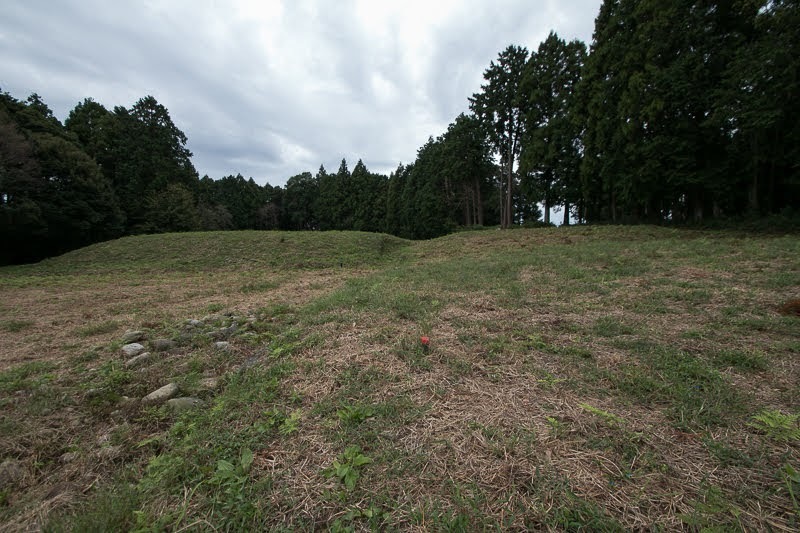 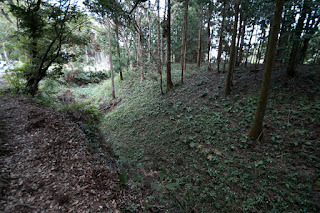 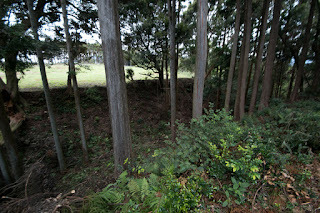 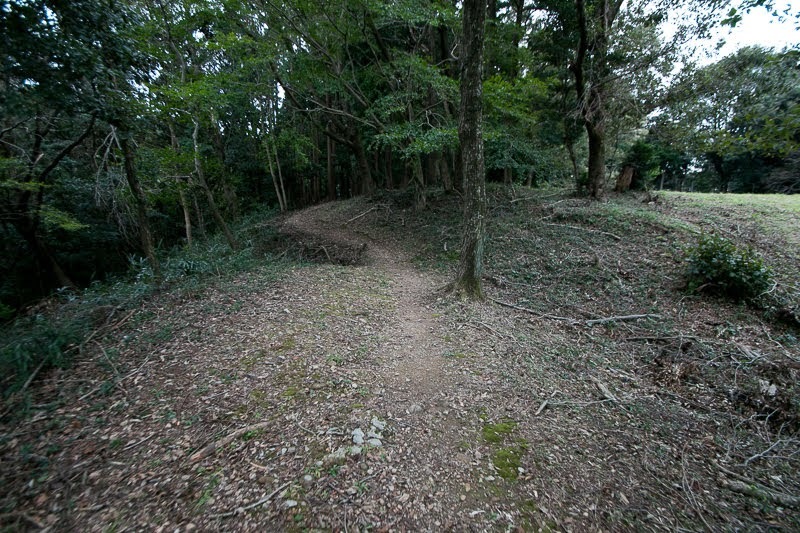 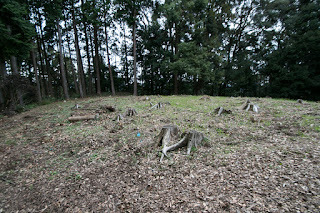 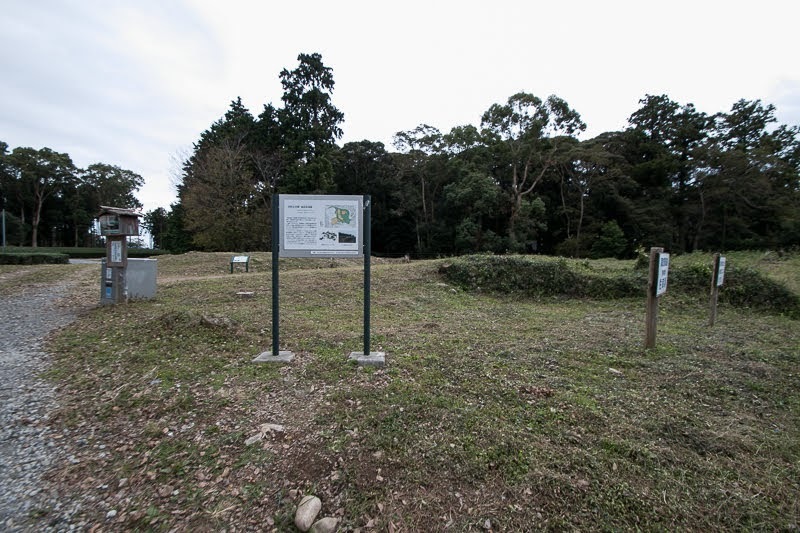 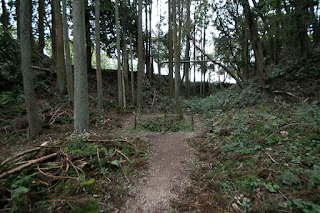 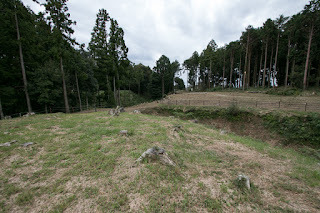 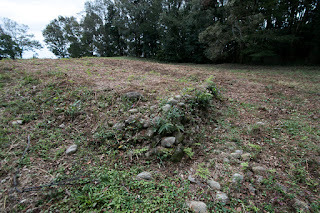 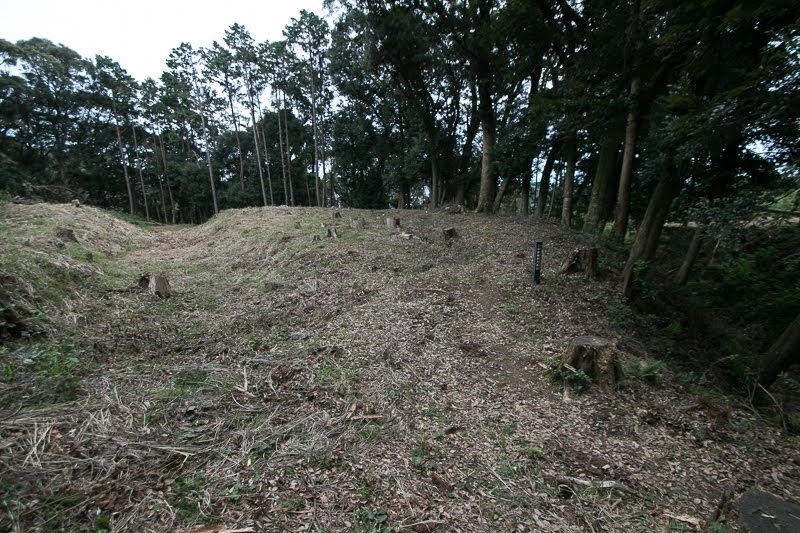 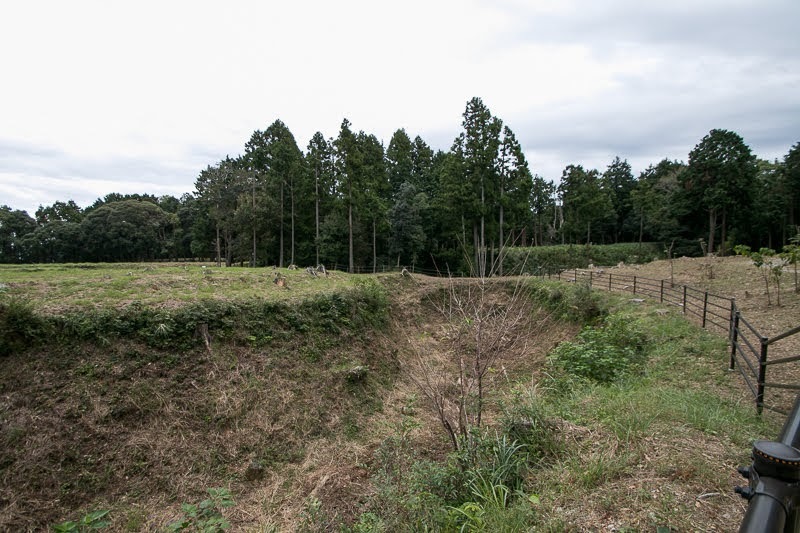 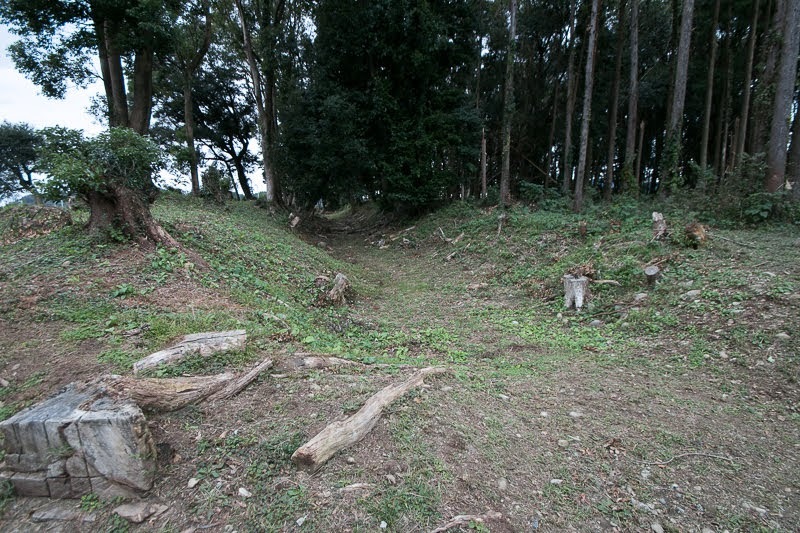 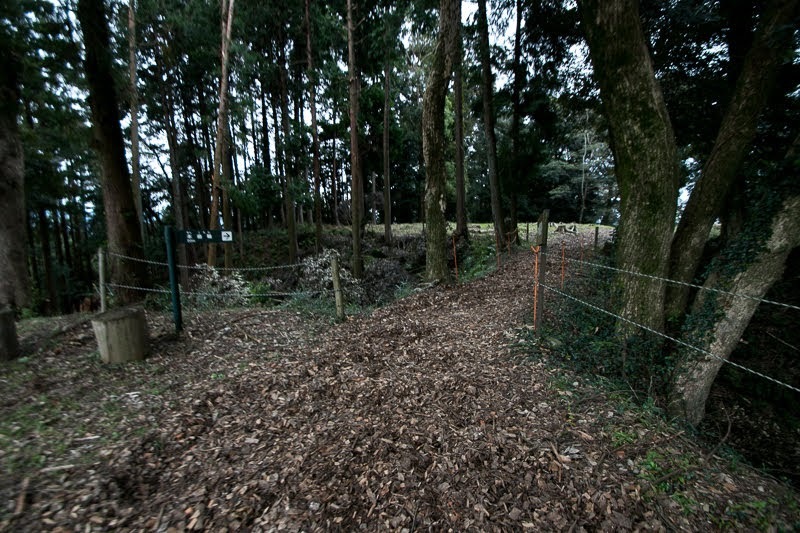 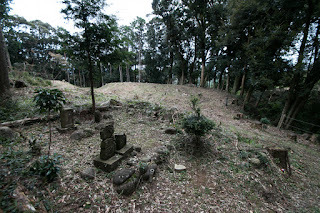 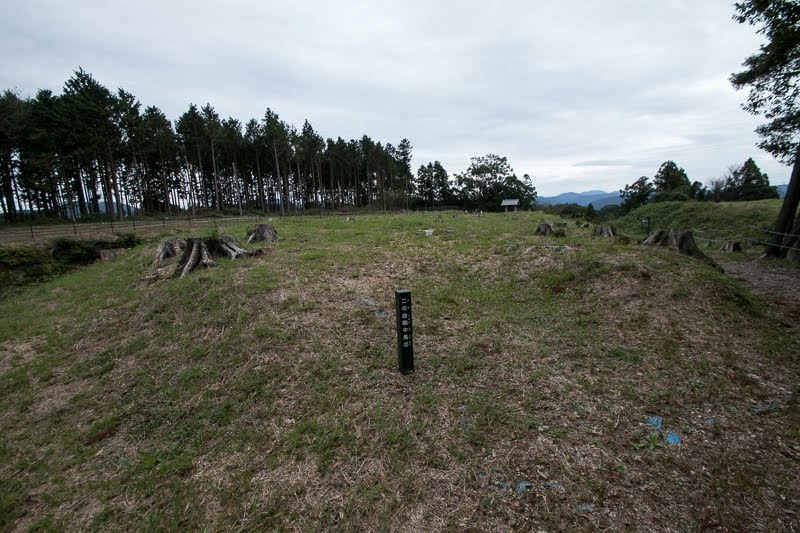 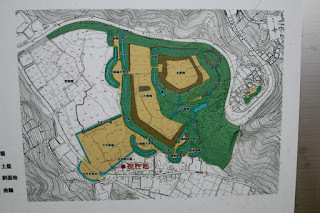 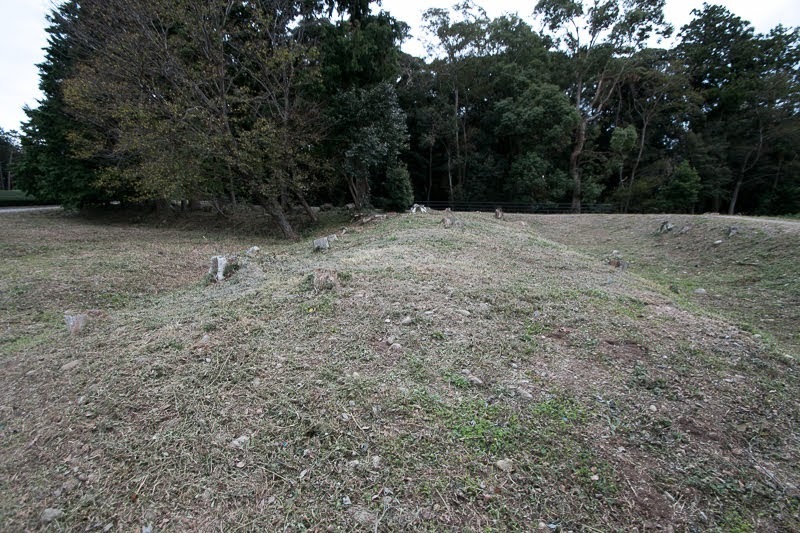 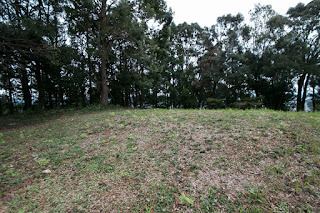 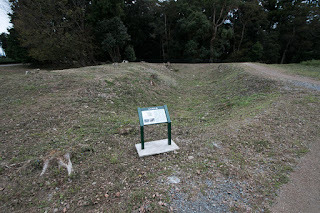 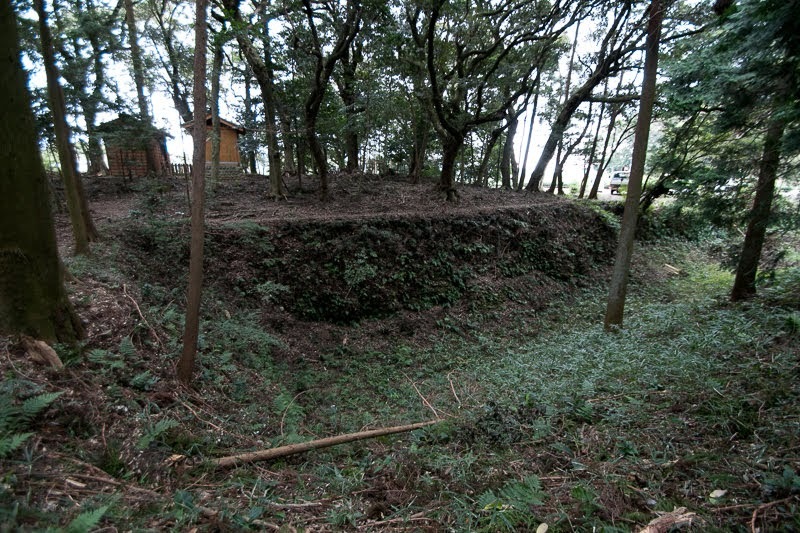 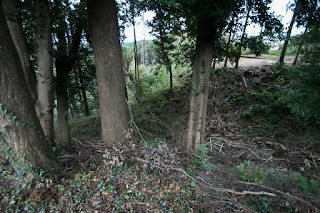 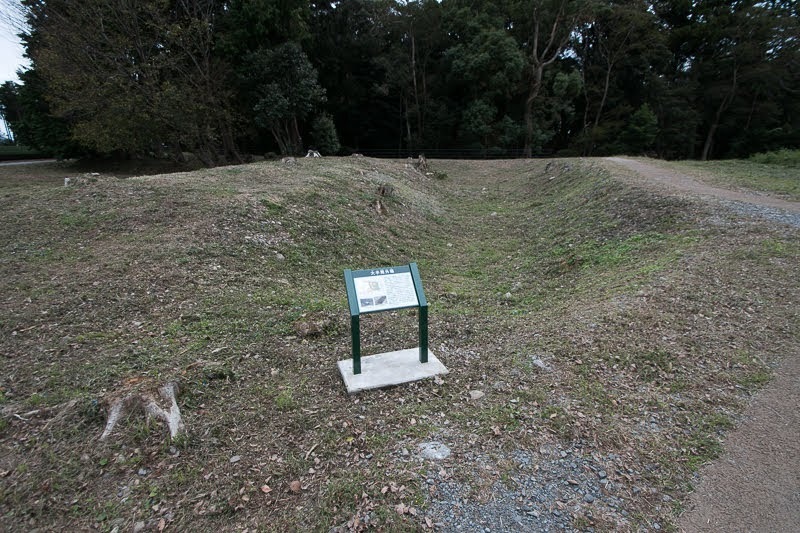 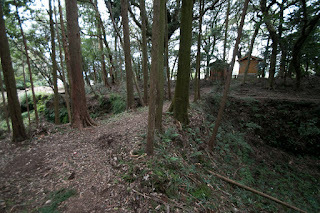 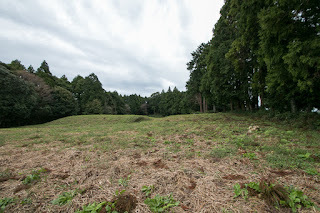 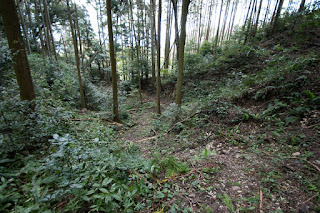 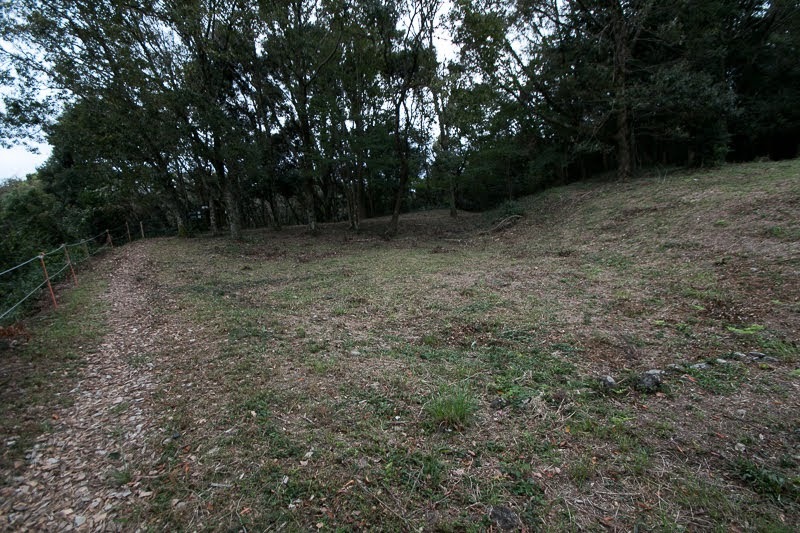 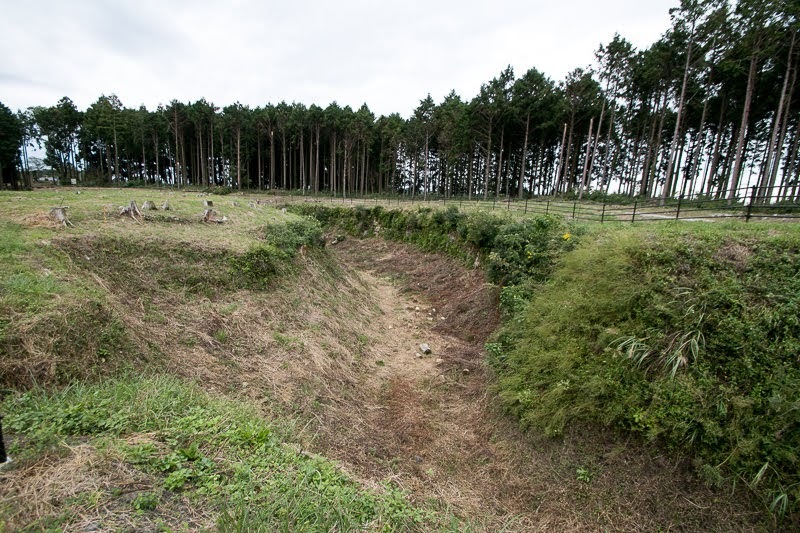 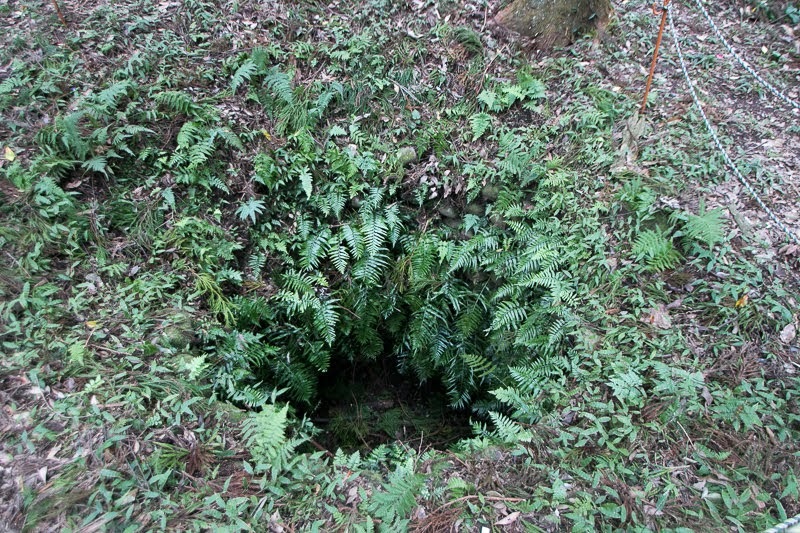 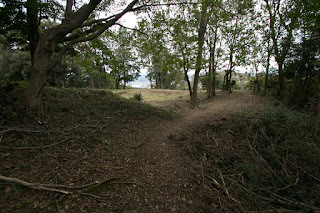 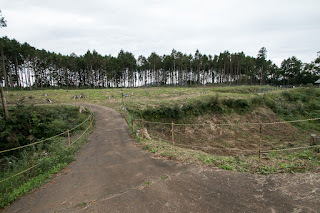 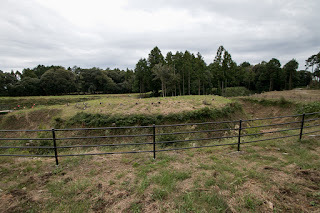 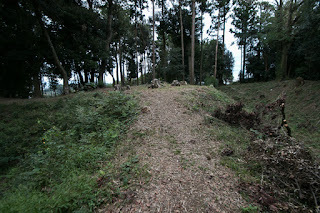 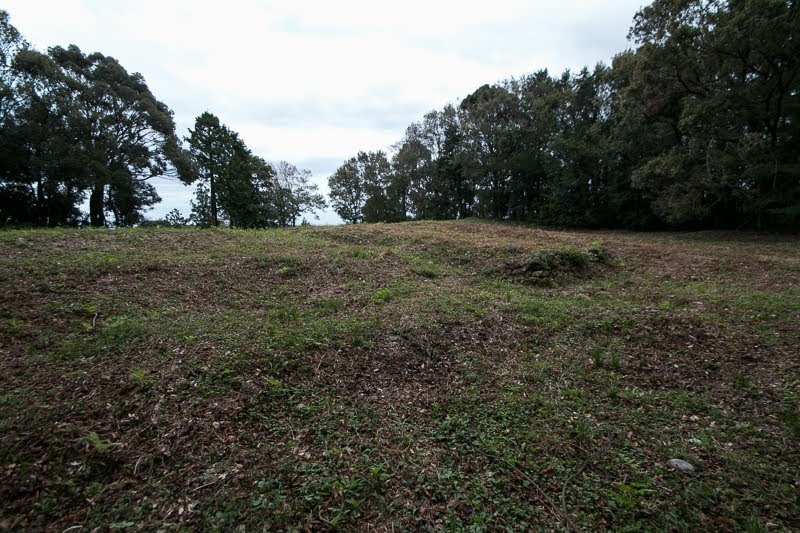 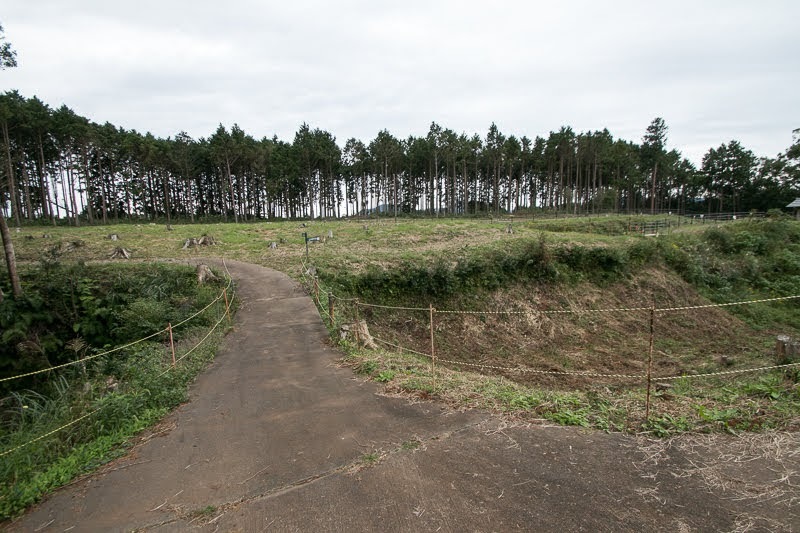 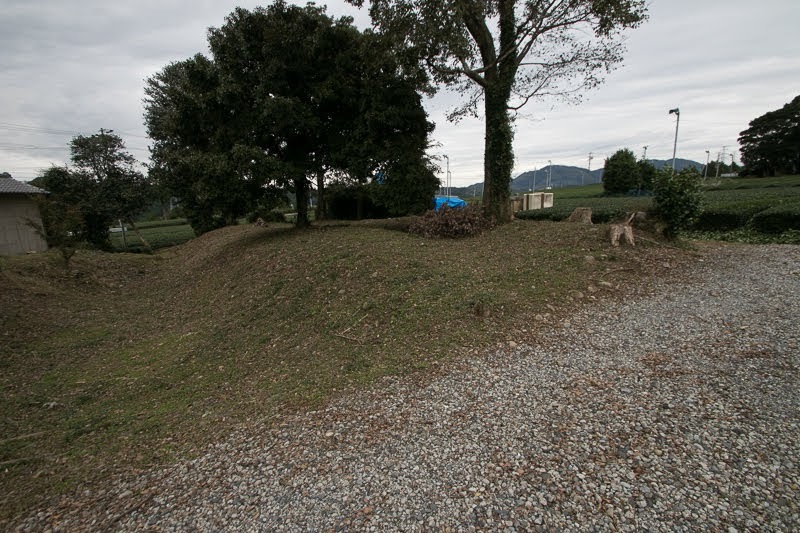 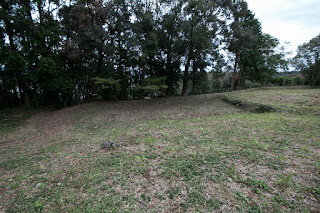 On the middle of outer line of secondary area and third area, there are two large semicircular shaped front fort called as "Umadashi", which area particular to castles of Takeda clan. 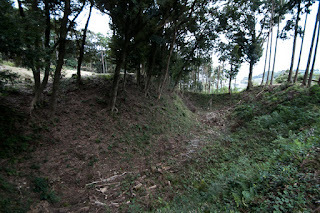 These forts are huge ones of about 40 meter diameter, which is protected by half round shaped dry moats and have gates at both sides. 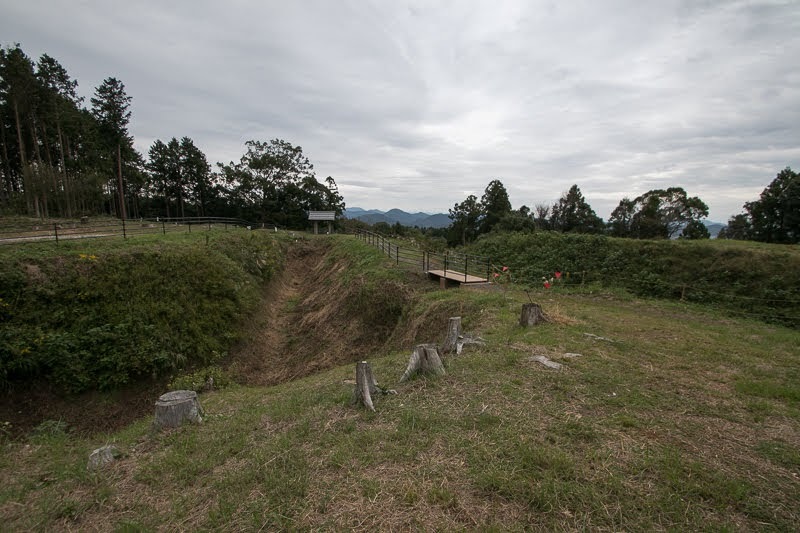 These parts were built to shoot enemies by arrow and matchlock guns from inside, and work as buffer area to support sally and retreat of enemies. 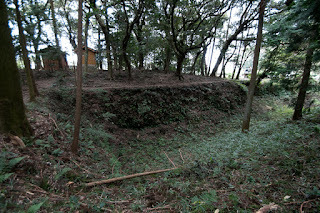 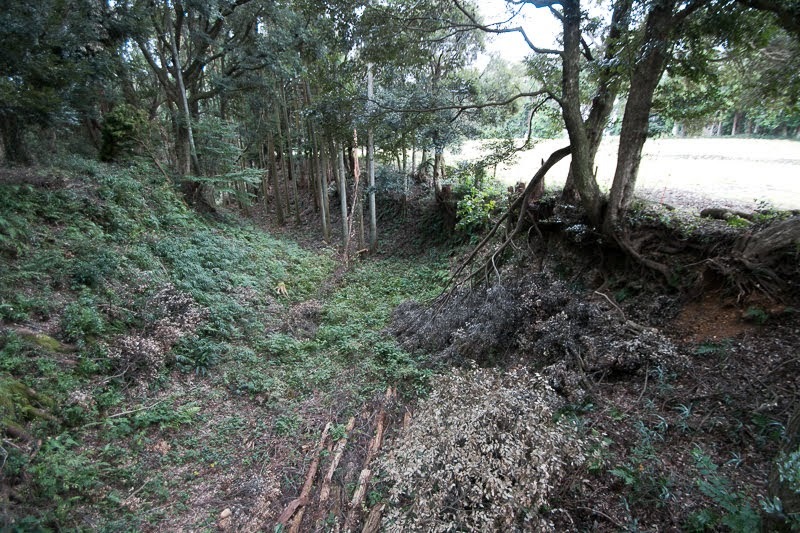 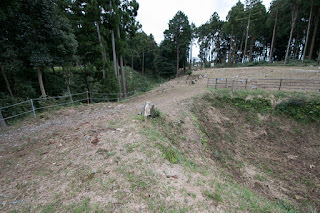 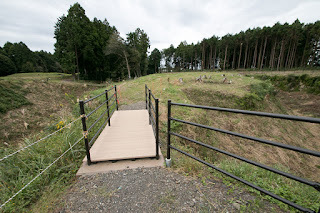 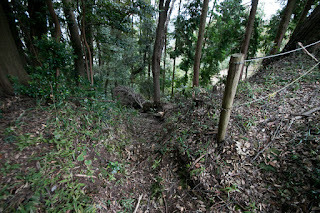 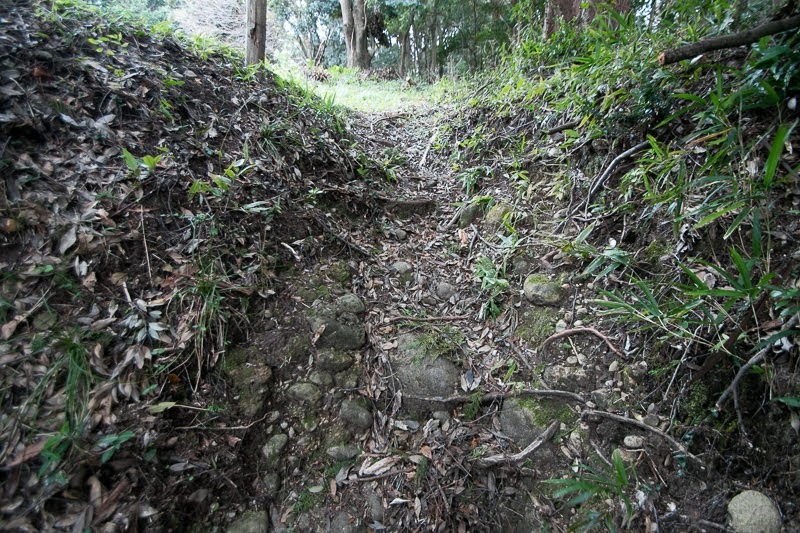 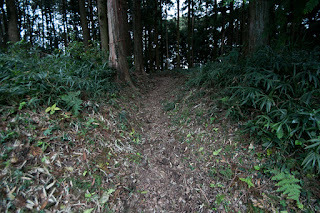 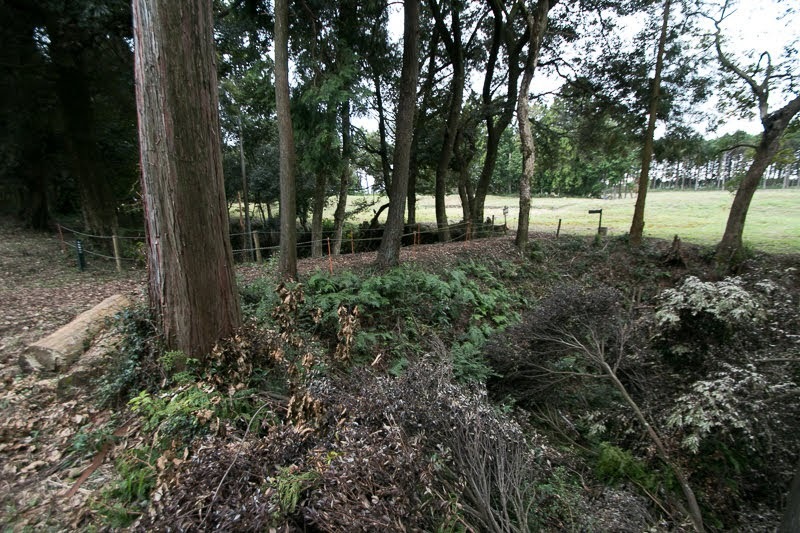 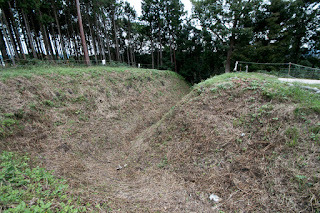 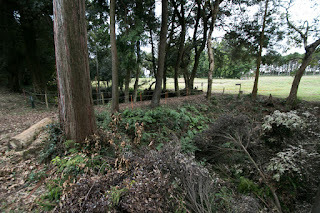 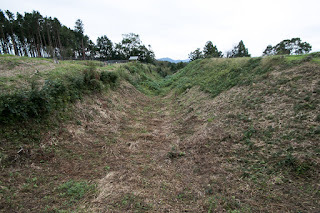 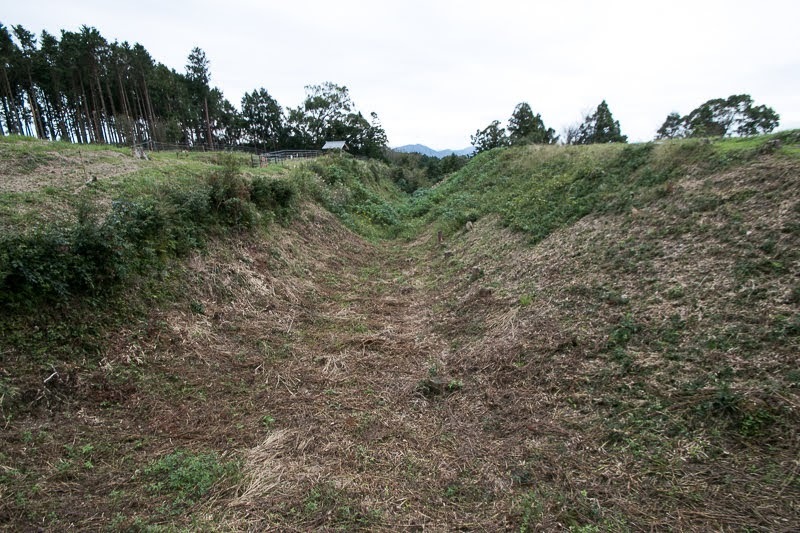 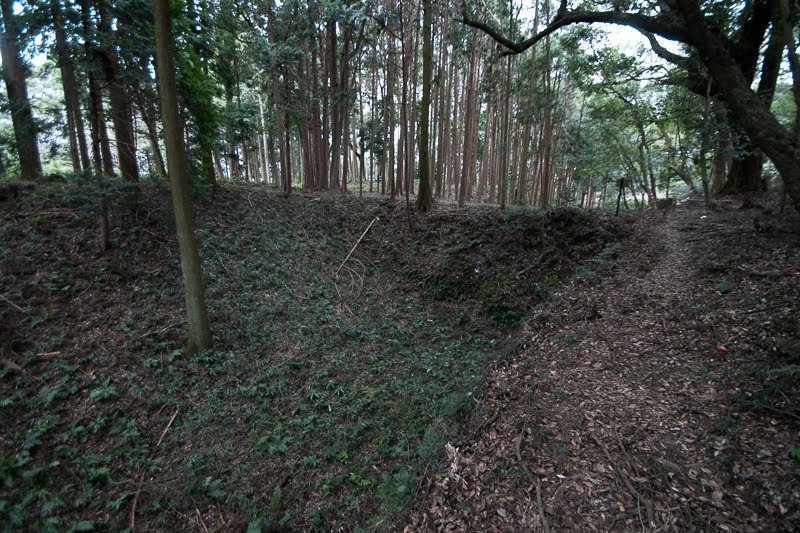 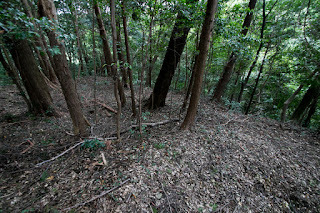 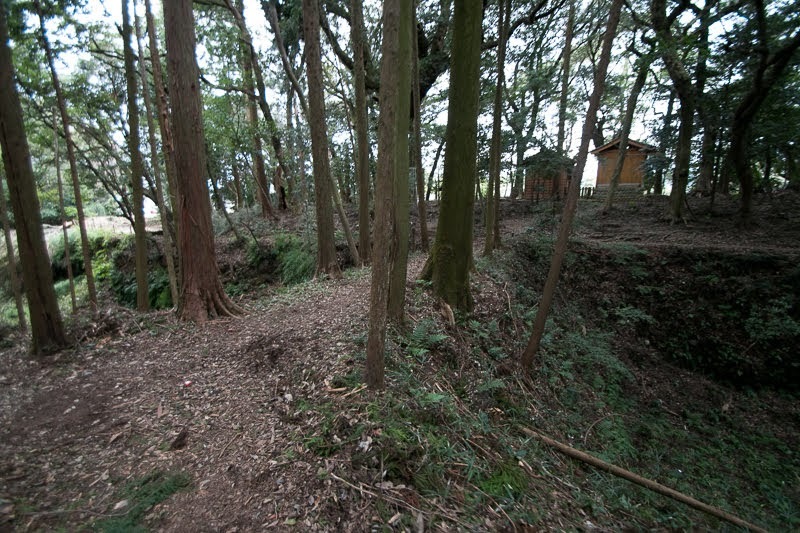 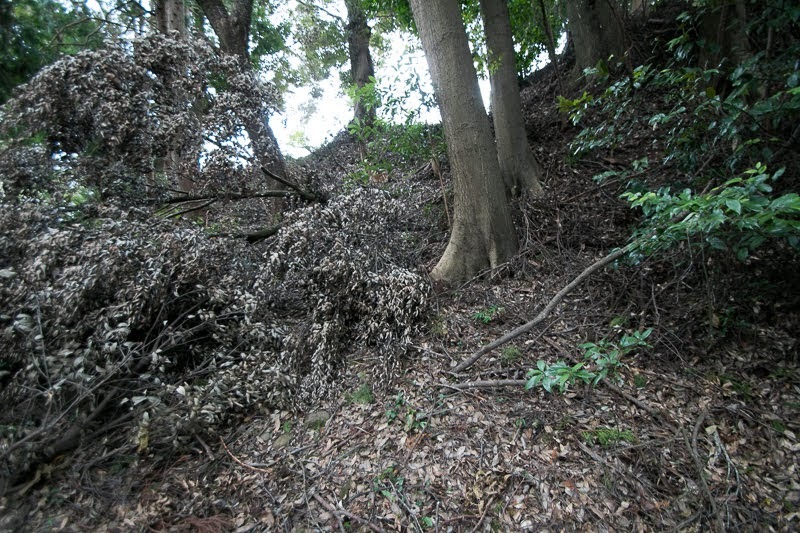 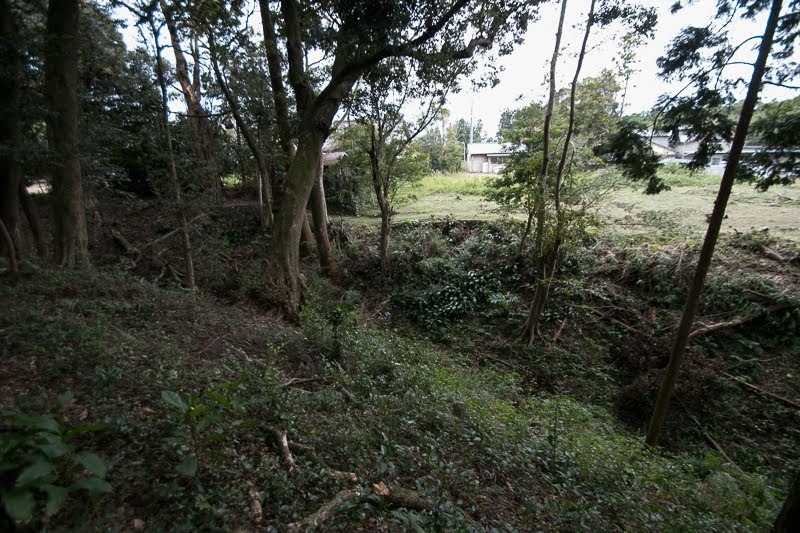 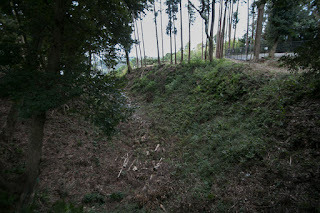 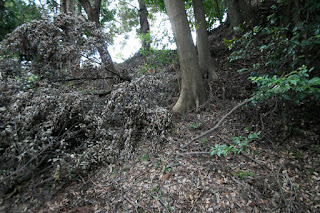 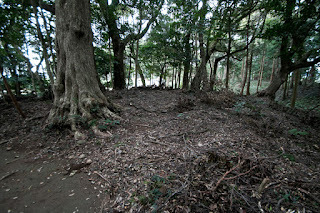 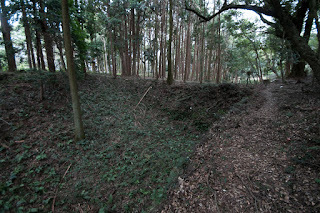 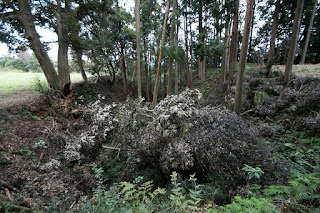 As the both edge of outer moat are expected approach point of the enemy escaping shoots from Umadashi, these parts are securely protected by combination of small Umadashi, also seen at Konagaya castle (Shizuoka prefecture) at upstream of Oi-gawa river. 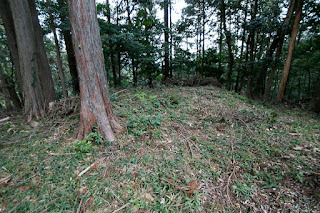 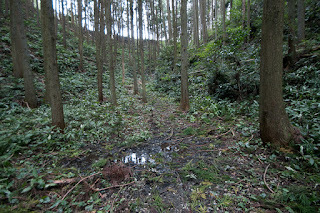 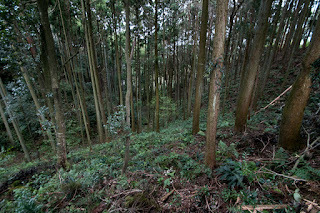 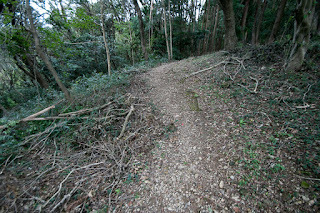 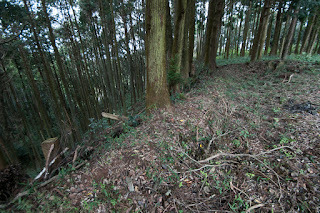 Total size of the castle is about 300 meter long and 200 meter wide, and its size and construction of the castle shows this is an important supply base of Takeda clan at this area. 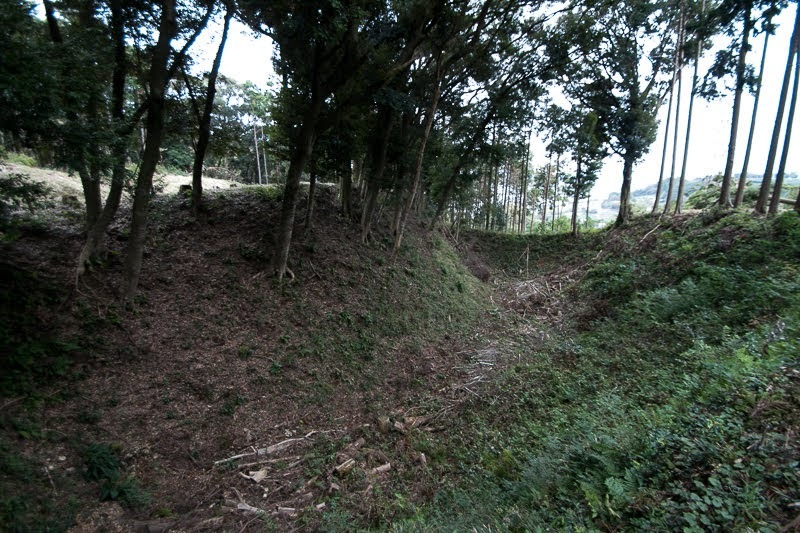 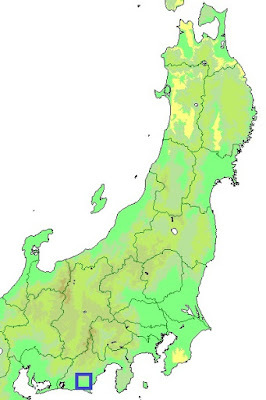 Utilizing Suwahara castle, in 1574, Katsuyori captured Takatenjin castle, a secure castle at 20 km southwest of Suwahara castle and was regarded that the holder of Takatenjin castle seizes Totomi province. 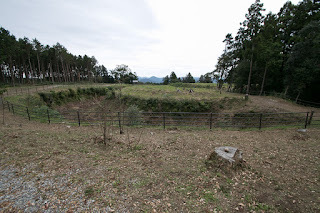 But next year, Katsuyori suffered severe defeat at the battle of Nagashino, and being lost many generals and soldiers, he could not continue attack to Tokugawa clan any more. 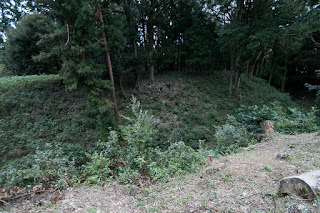 In 1575, Suwahara castle was attacked by Tokugawa clan, and guarding solders opened castle and retreated to Suruga province (middle part of Shizuoka prefecture). 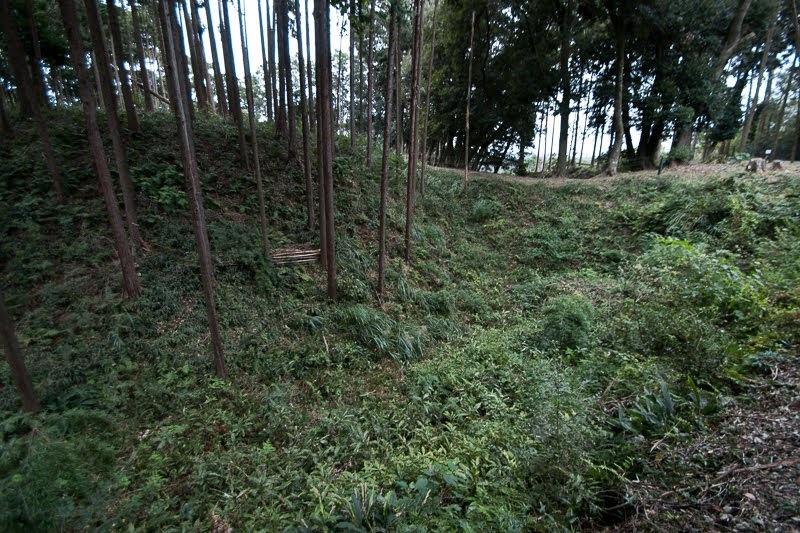 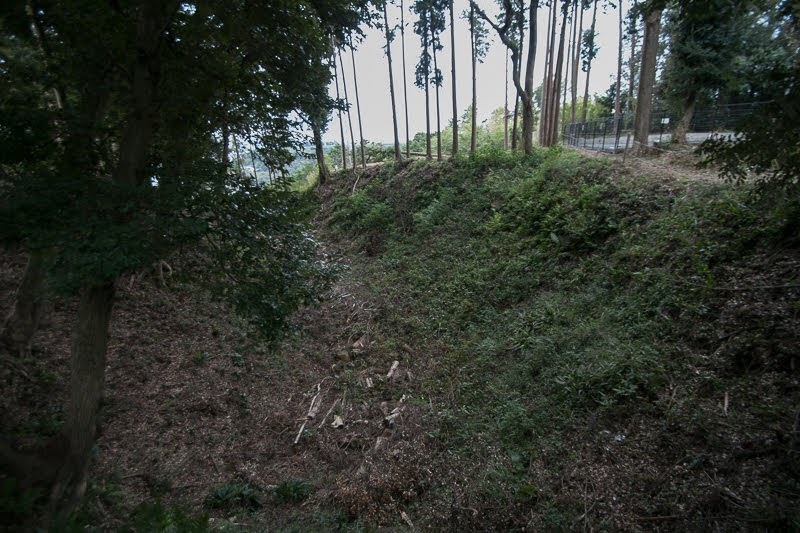 Even though having large moats and forts, but as being not planned for fierce battle and having only small soldiers, the castle could not resist to the attack of Tokugawa clan. 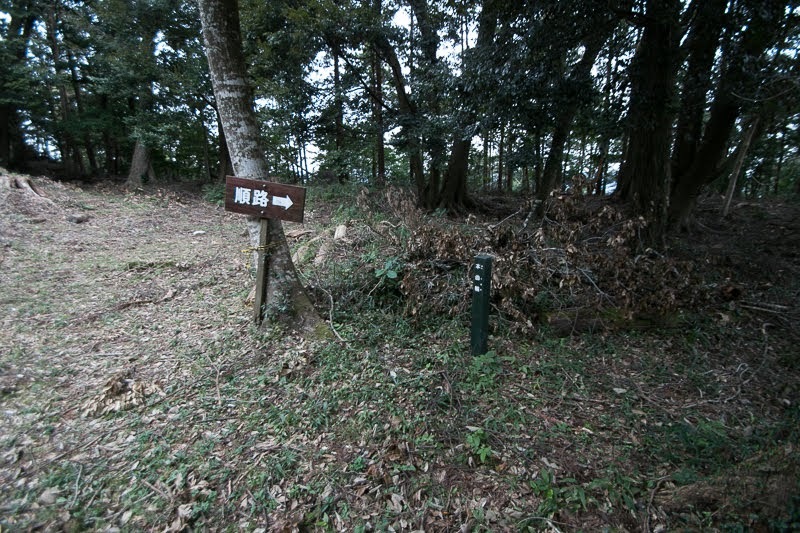 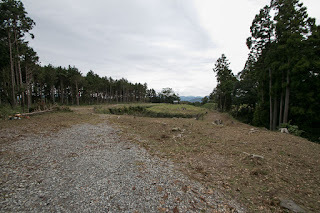 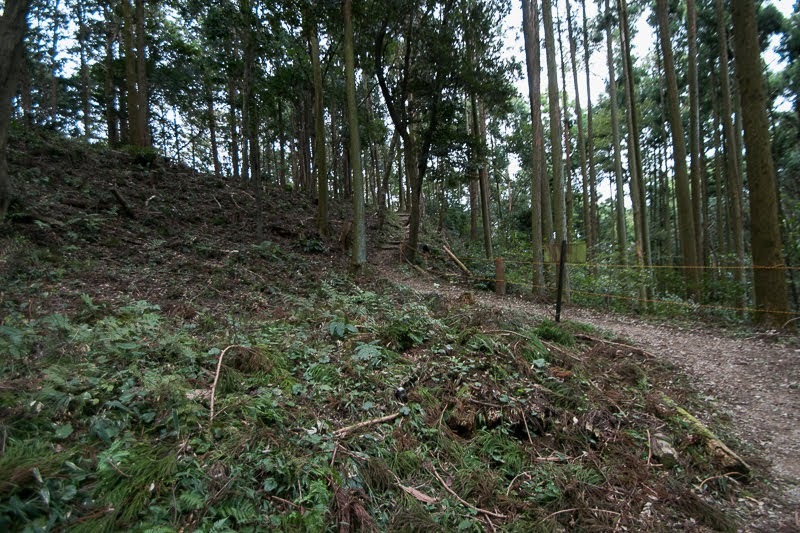 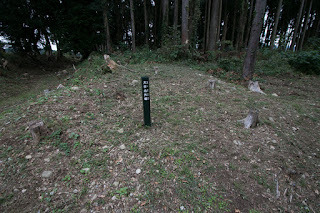 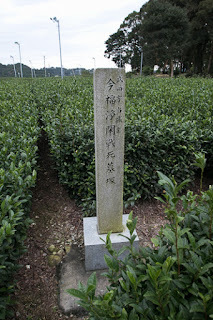 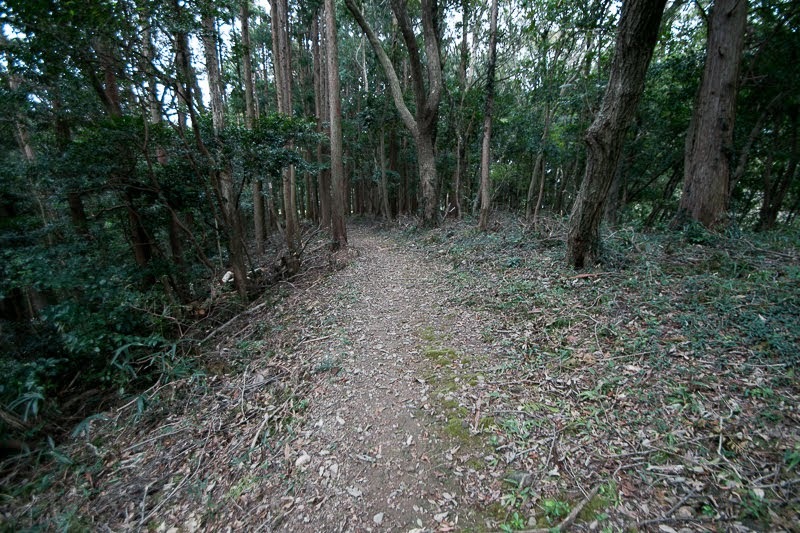 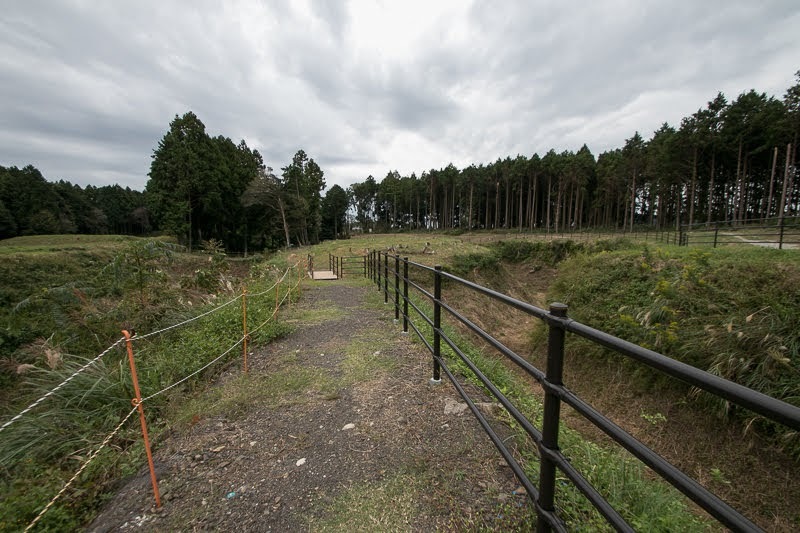 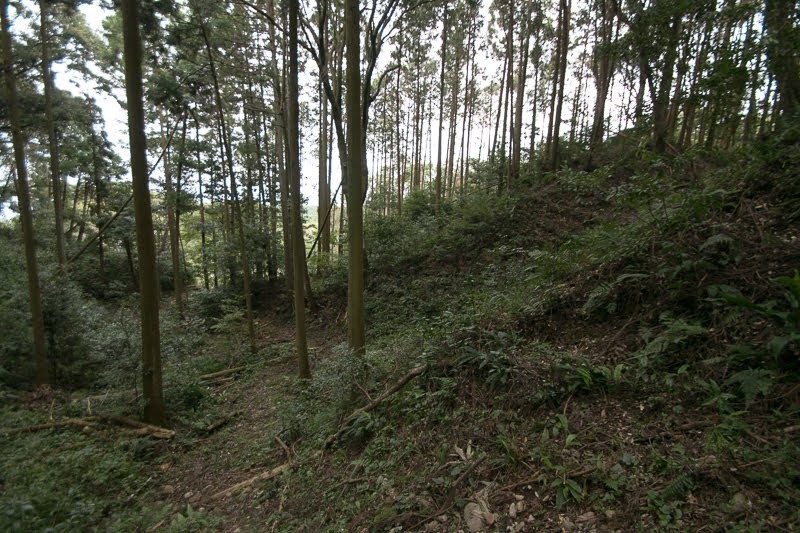 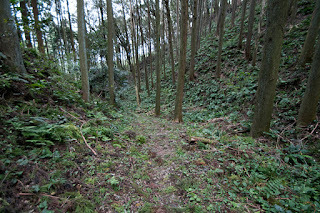 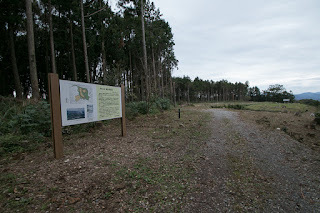 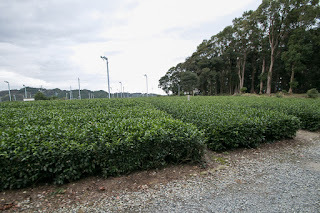 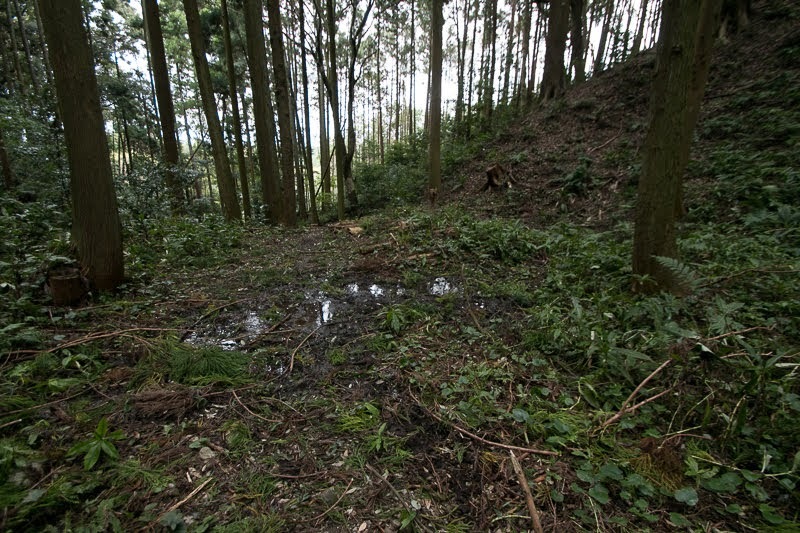 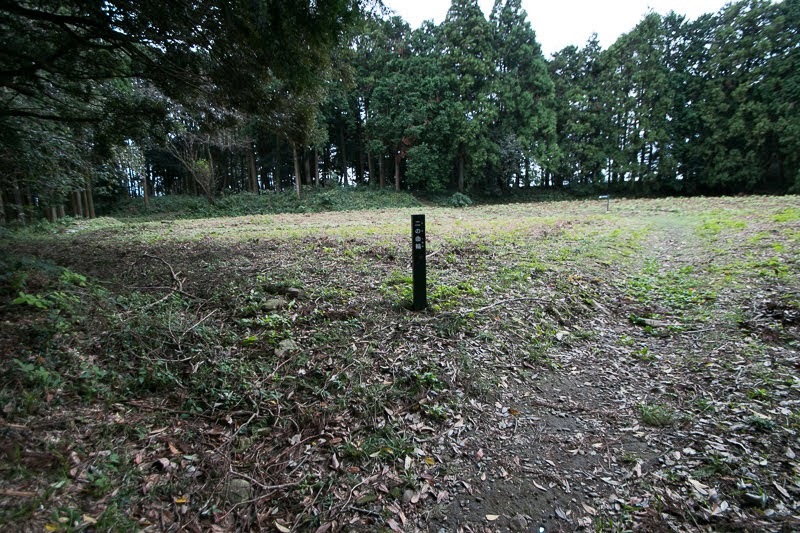 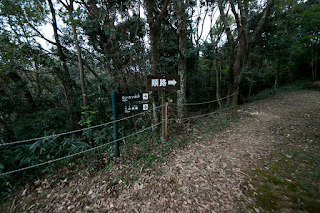 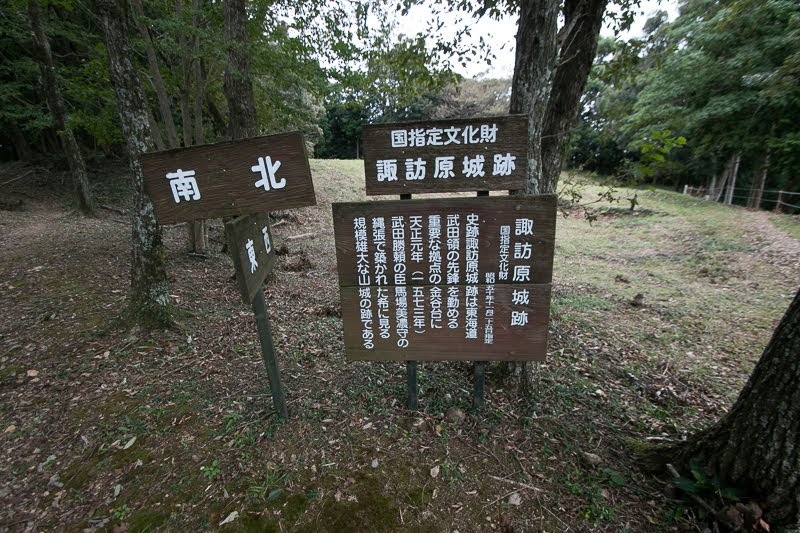 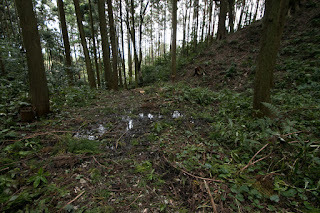 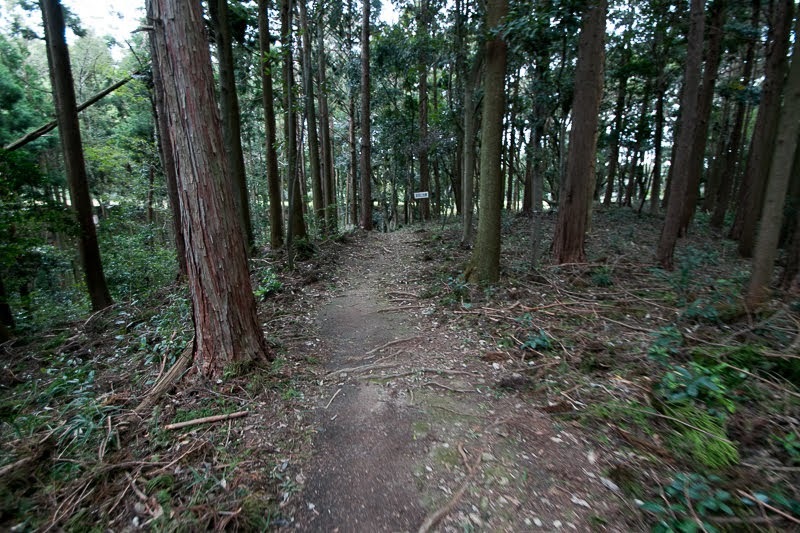 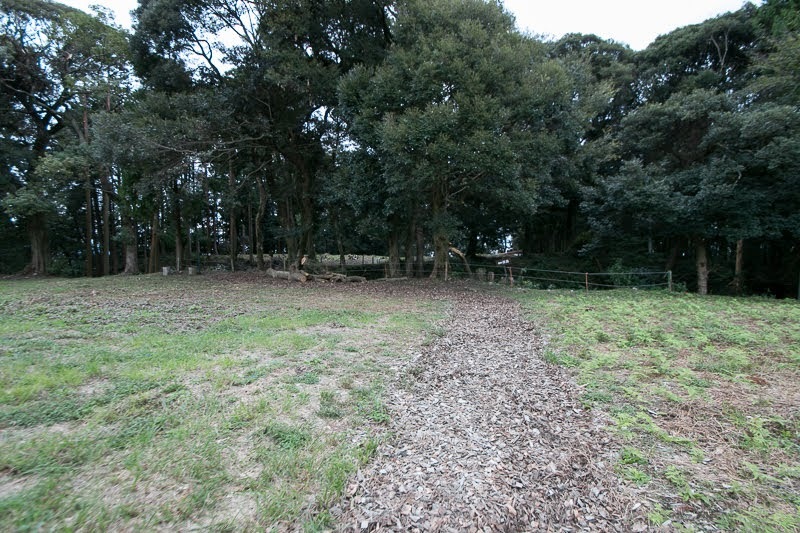 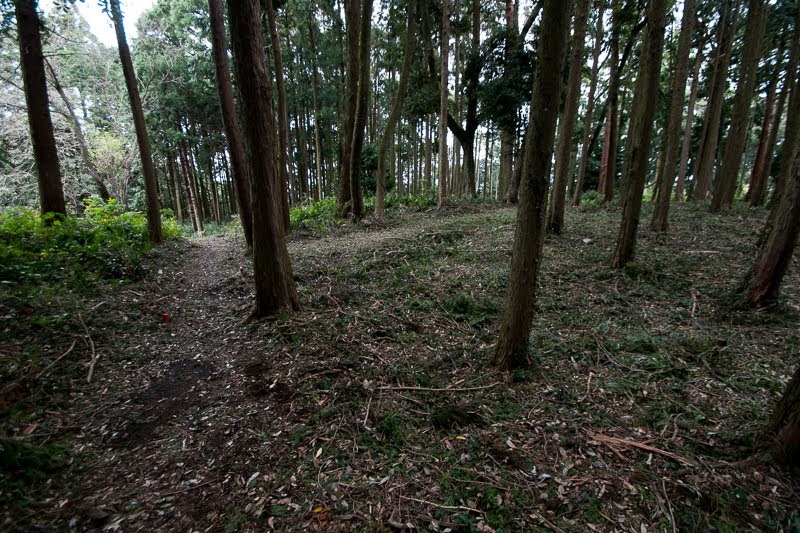 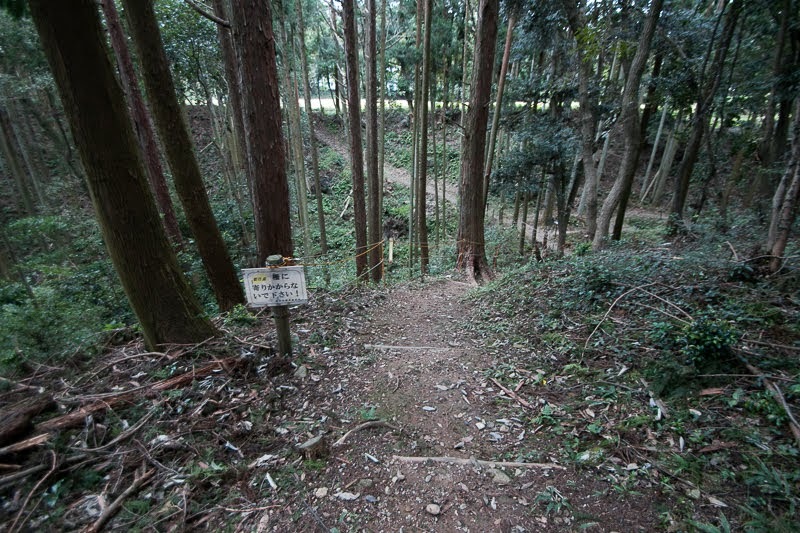 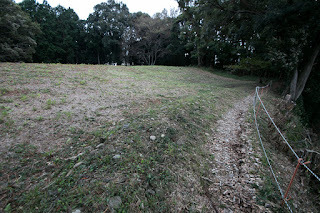 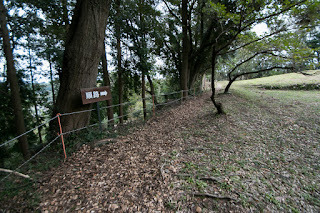 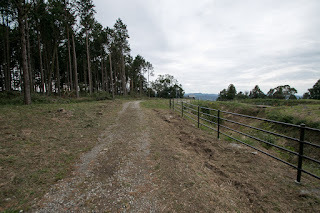 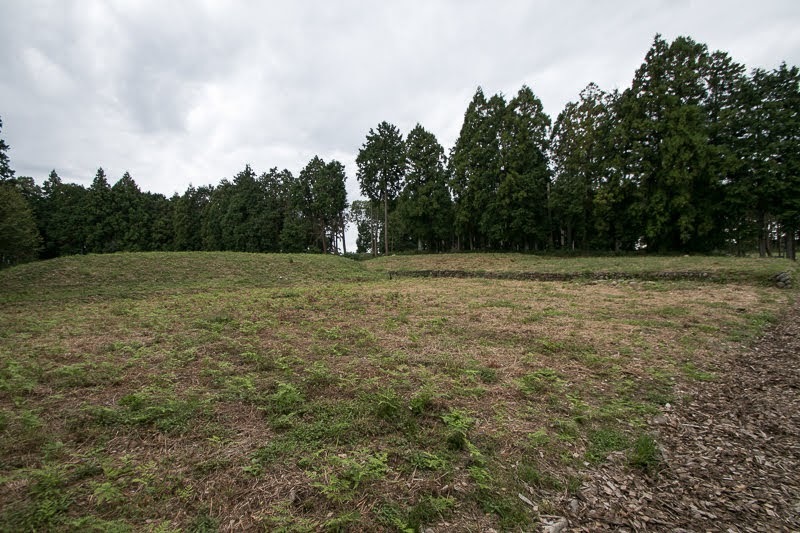 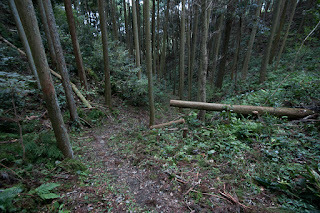 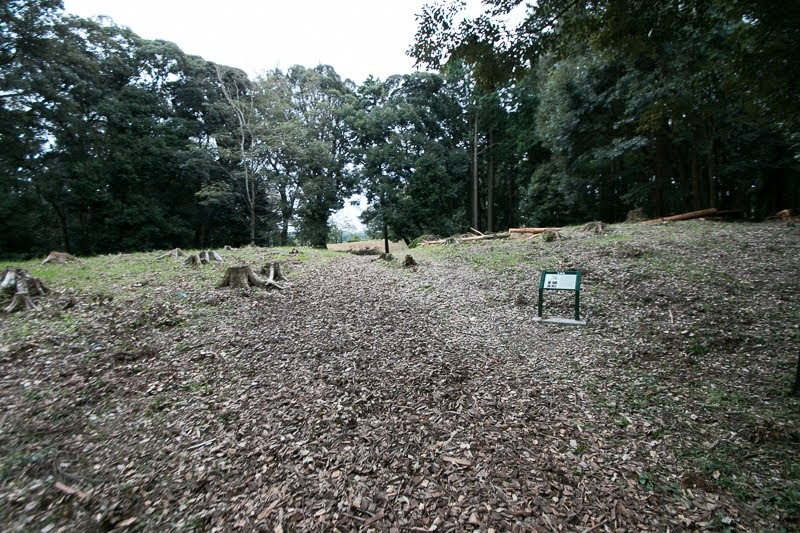 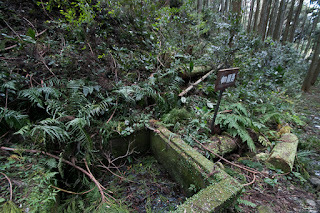 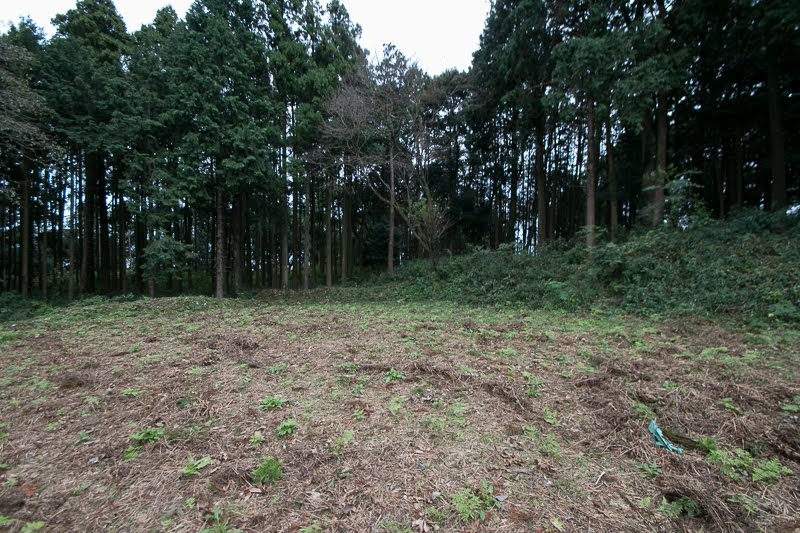 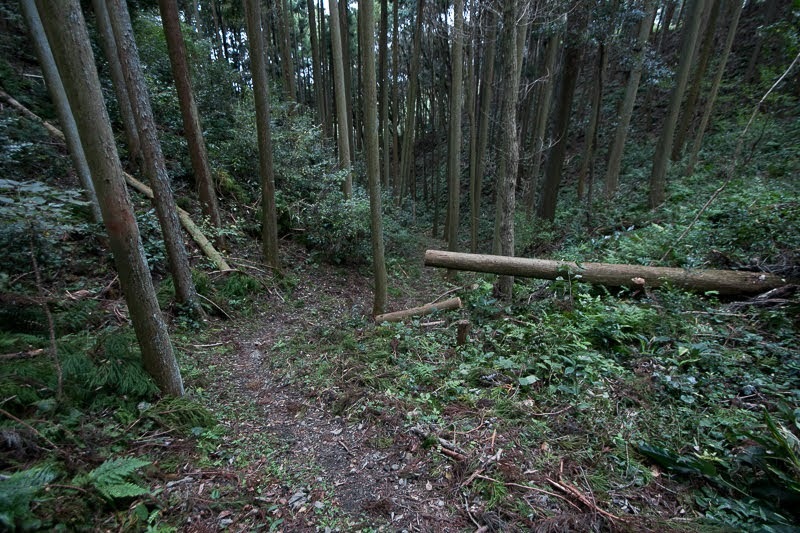 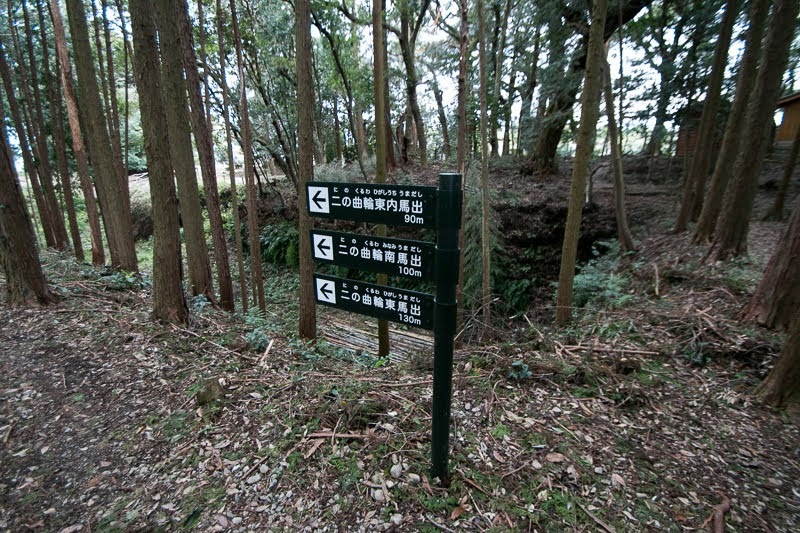 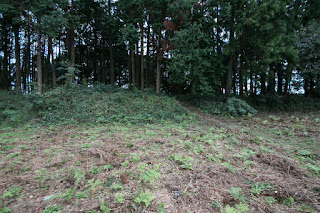 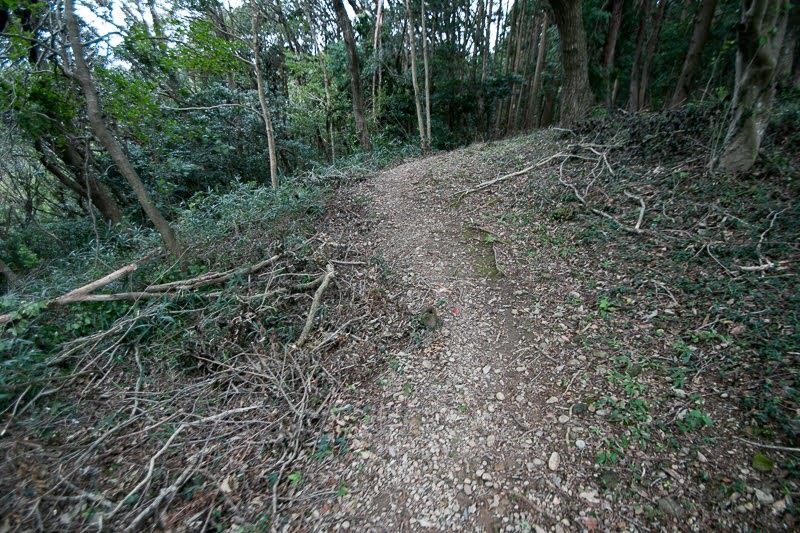 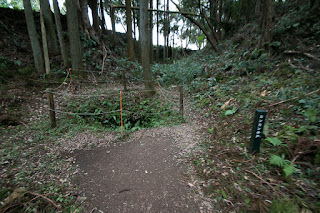 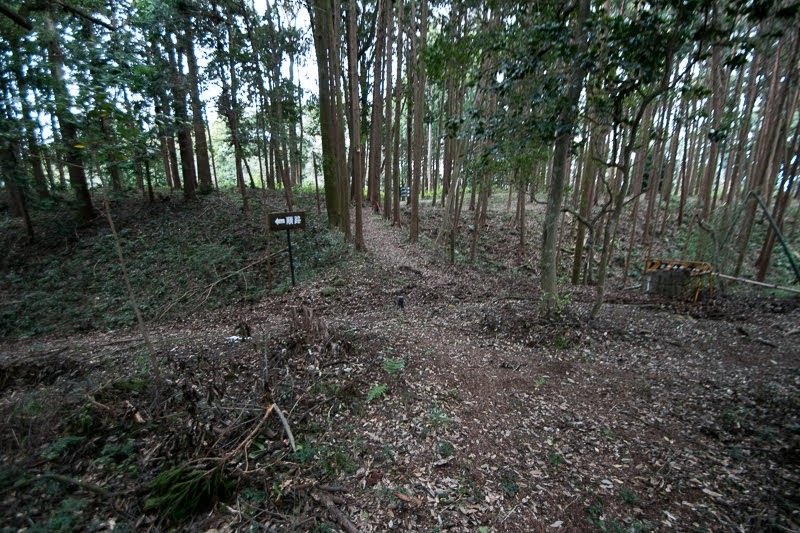 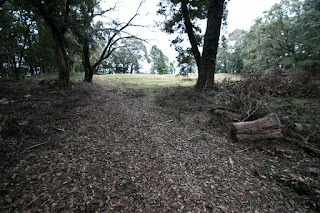 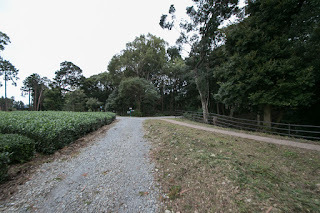 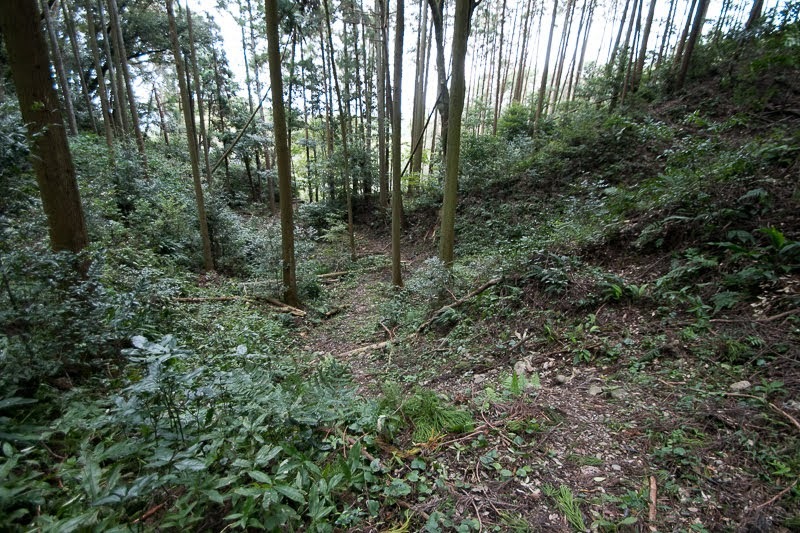 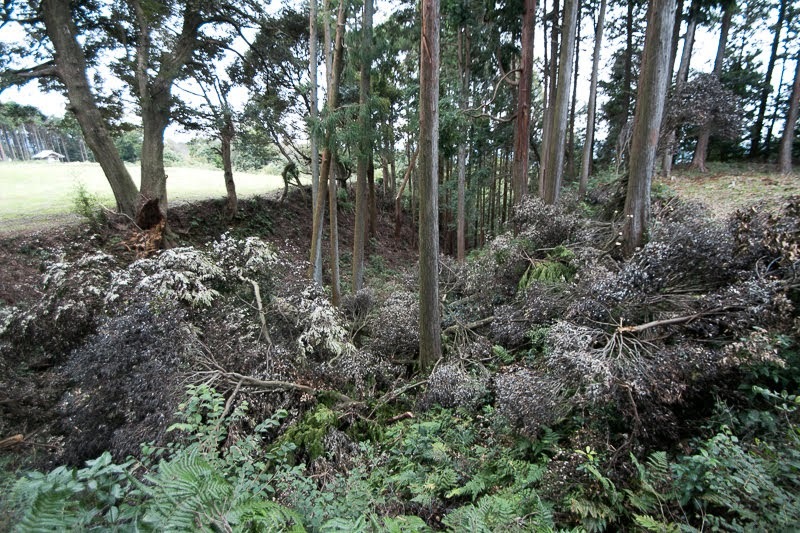 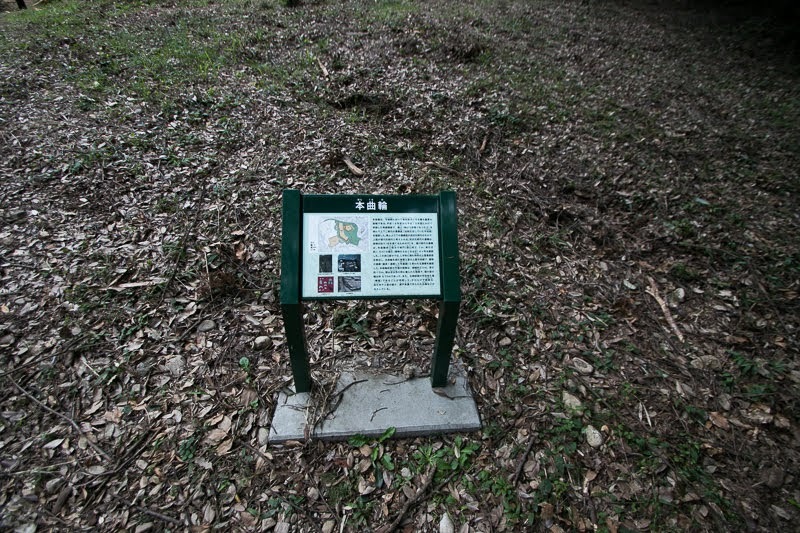 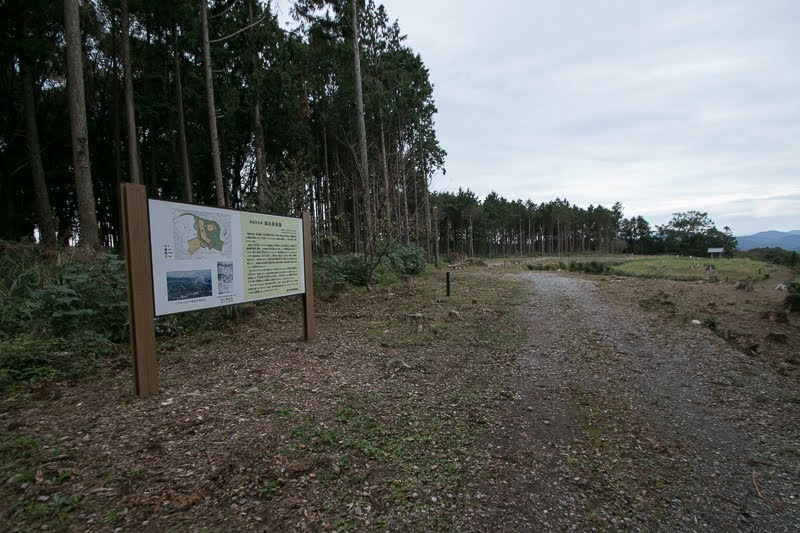 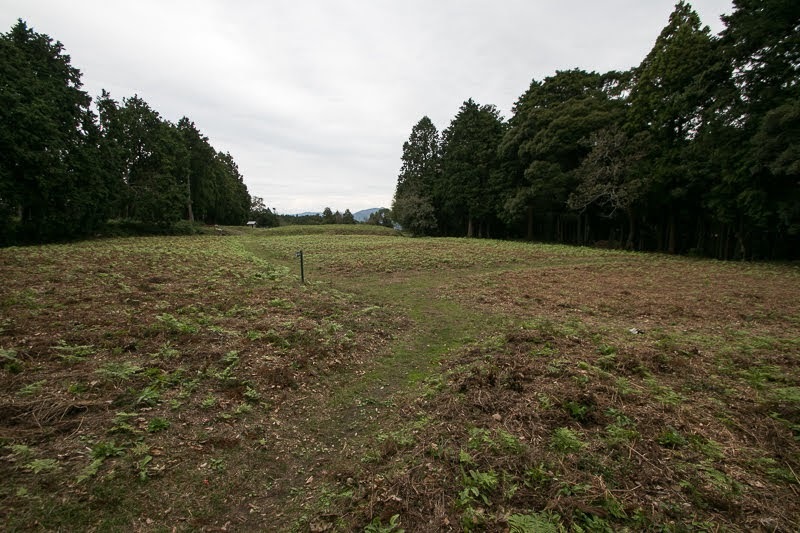 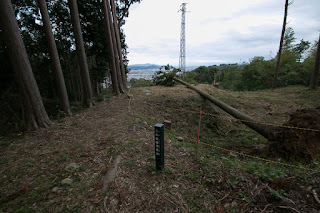 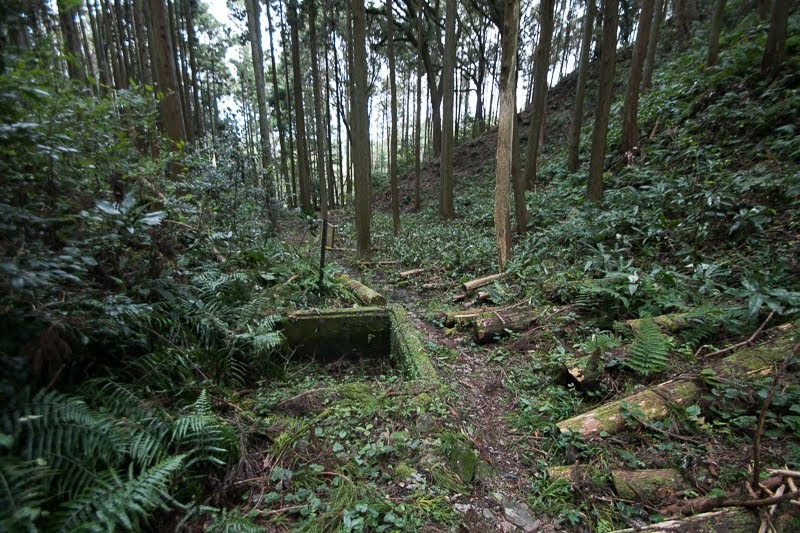 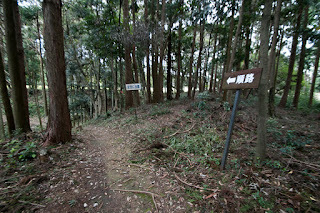 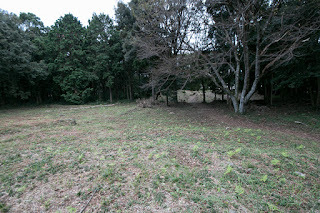 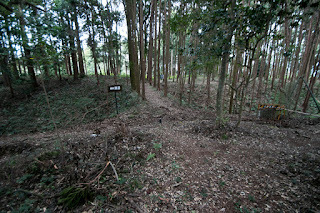 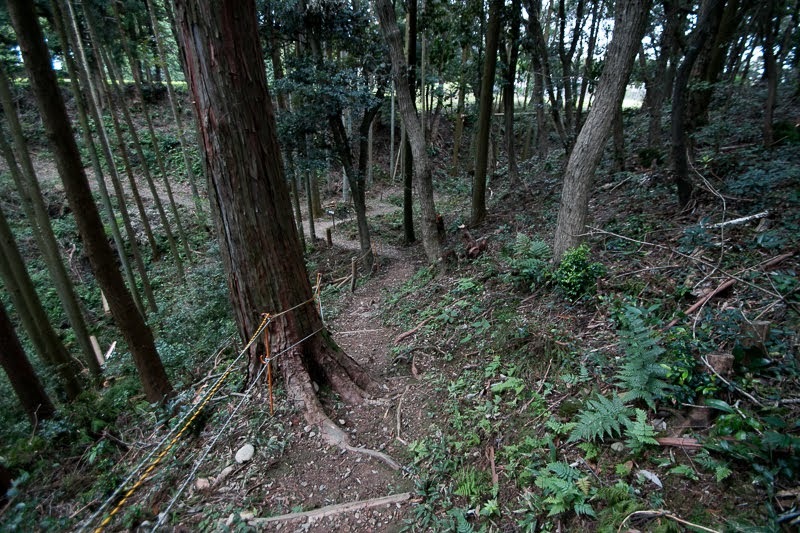 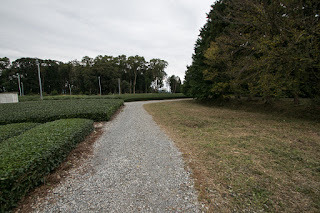 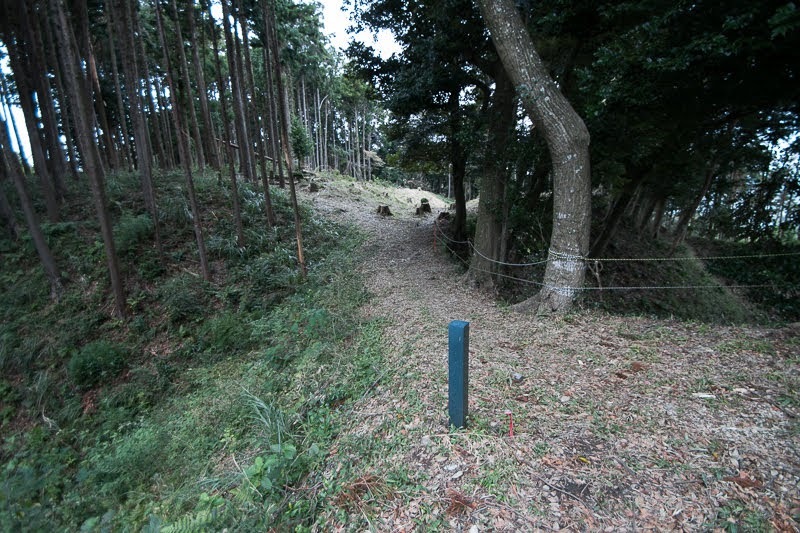 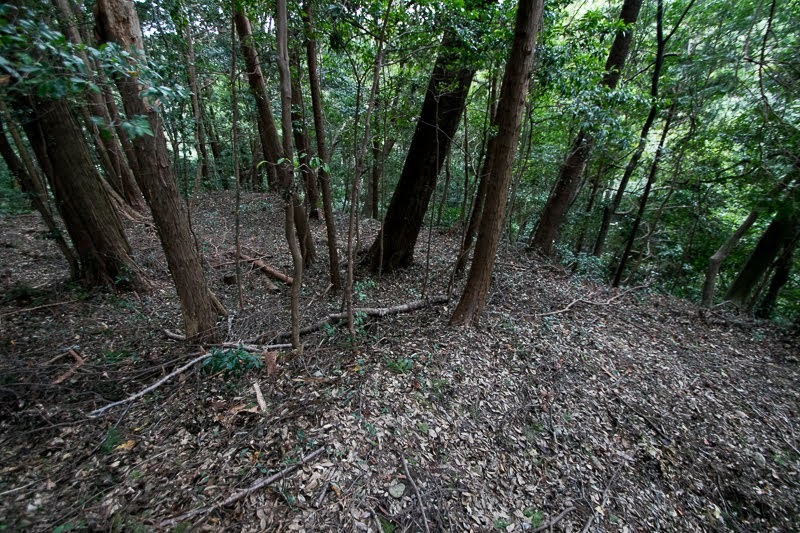 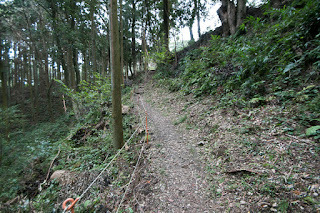 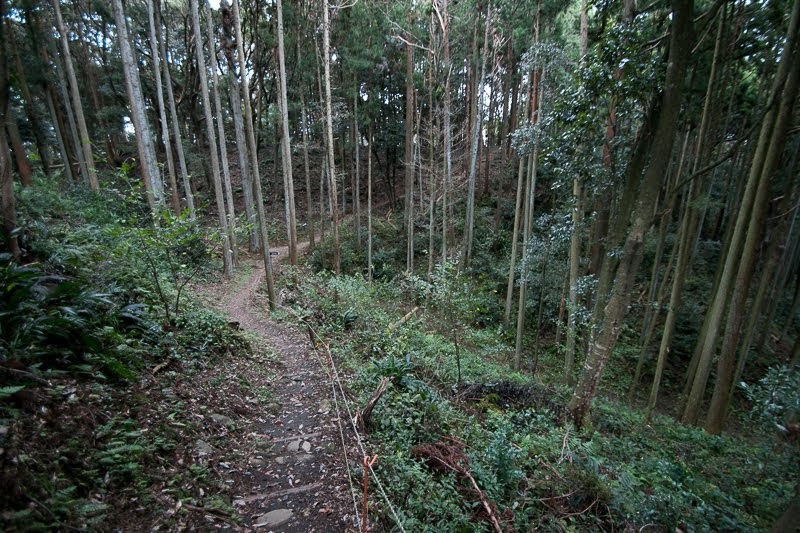 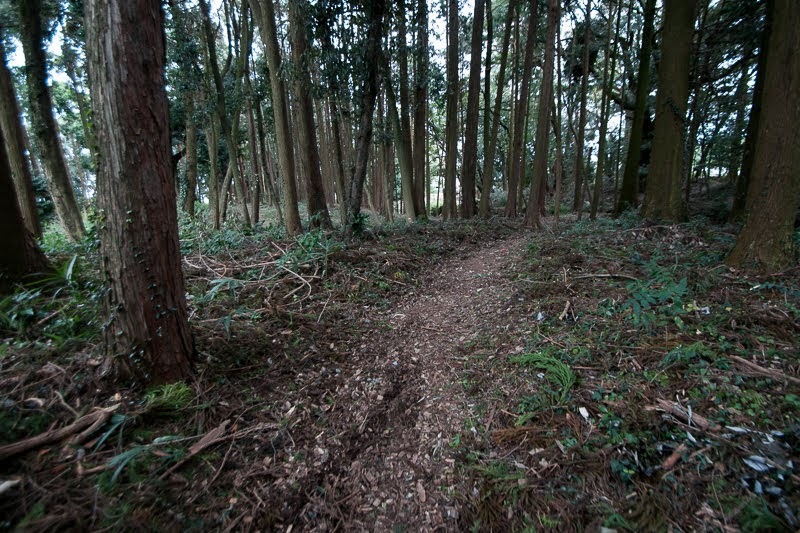 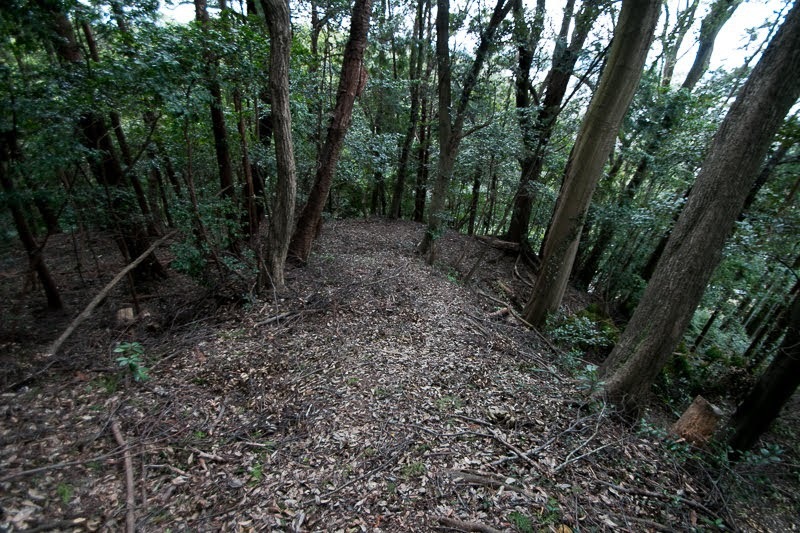 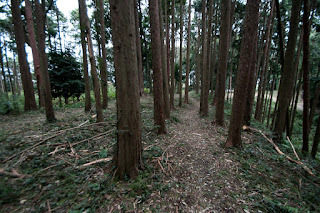 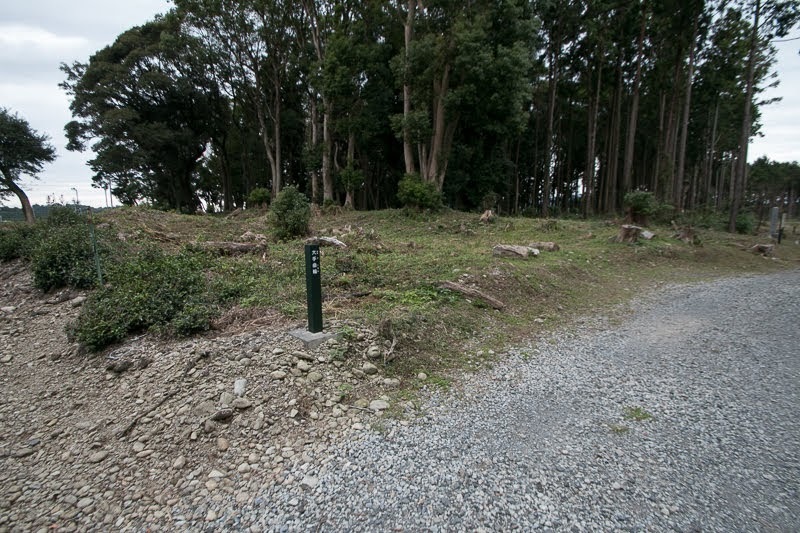 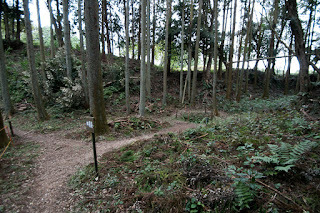 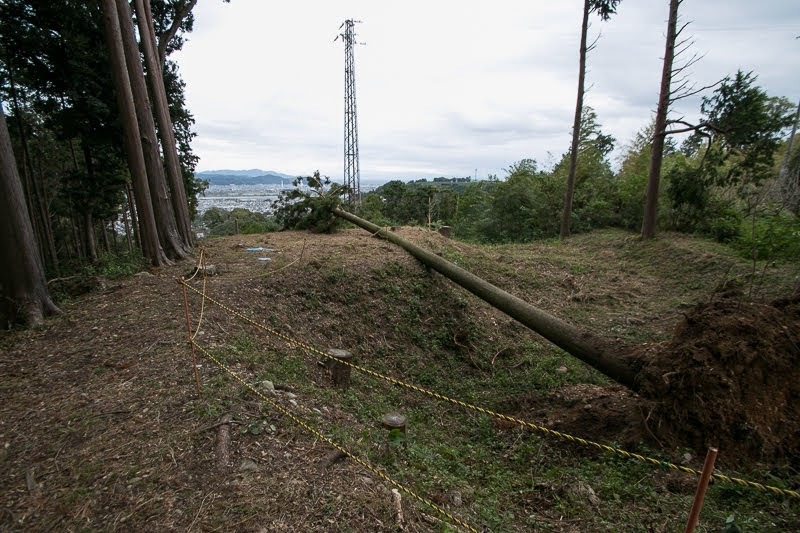 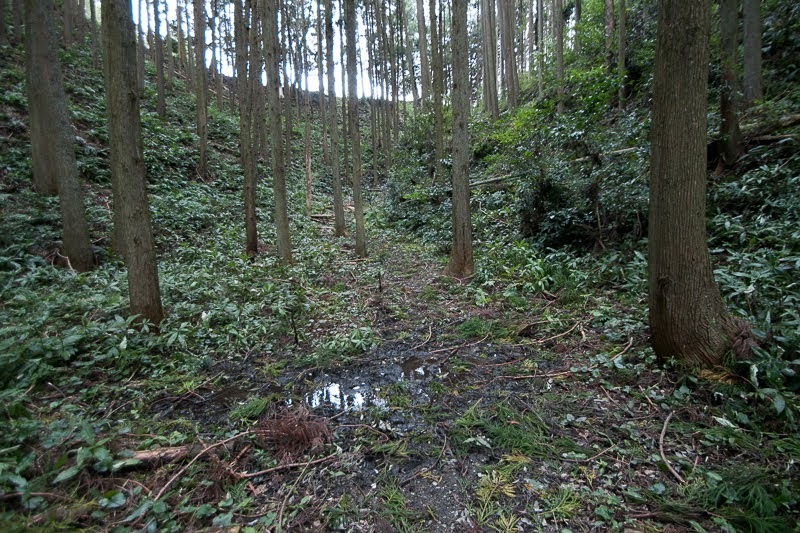 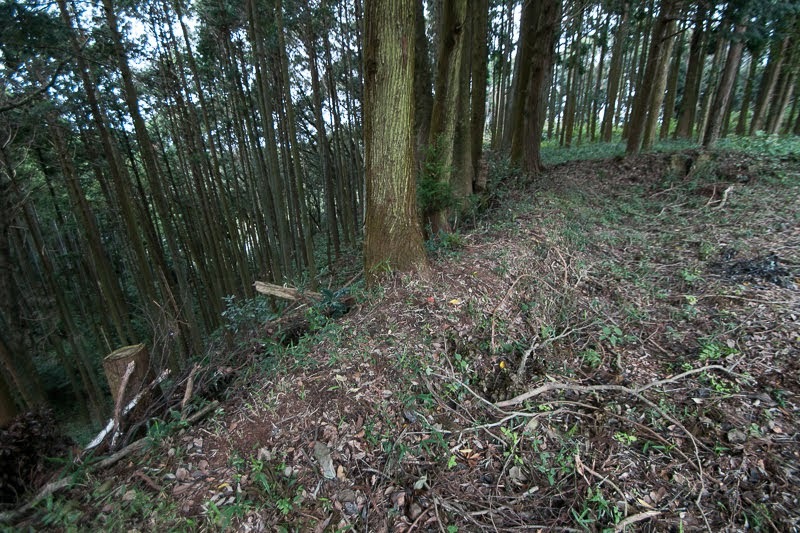 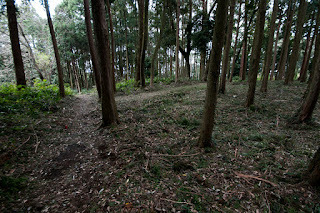 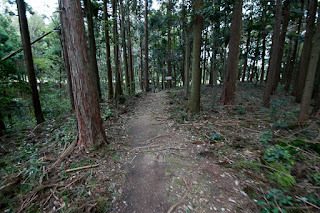 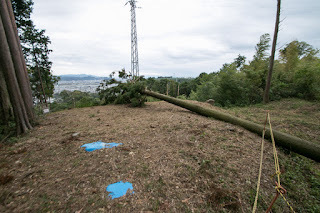 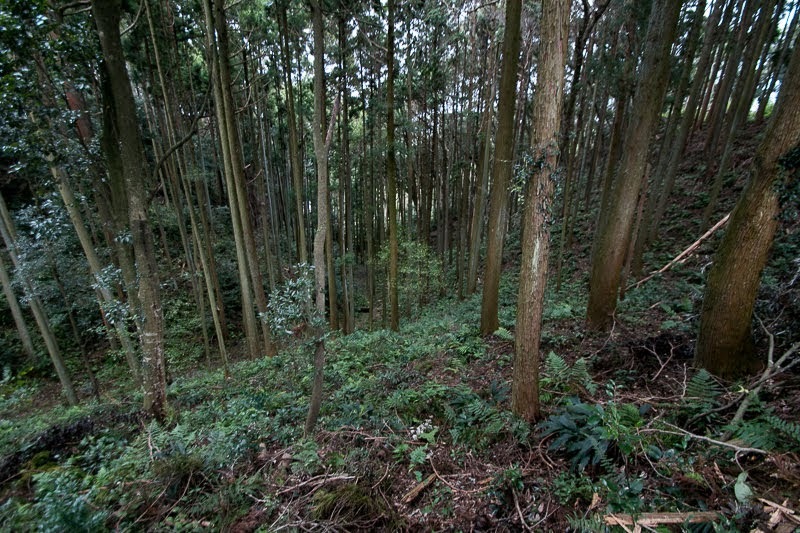 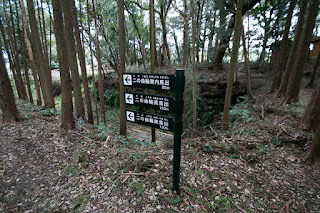 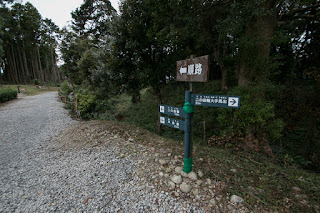 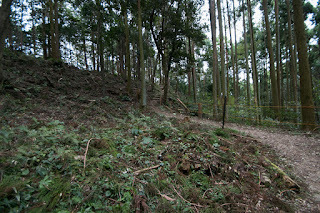 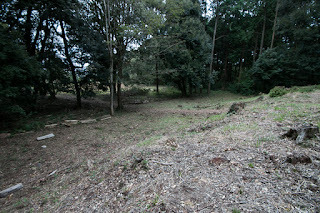 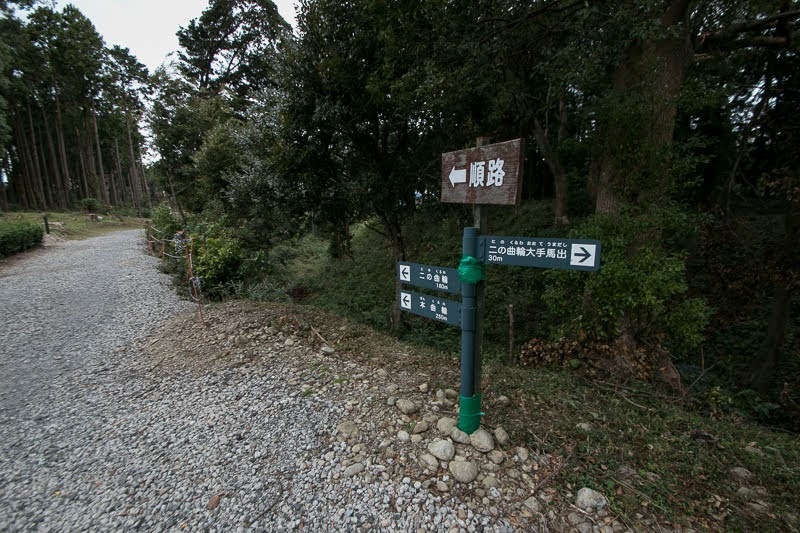 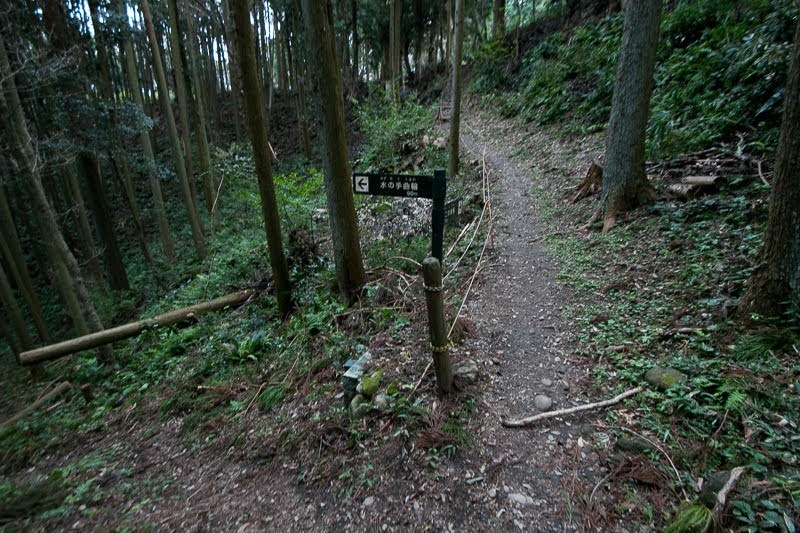 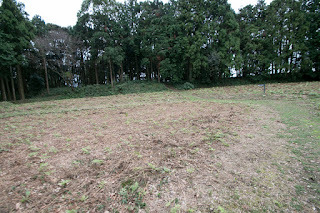 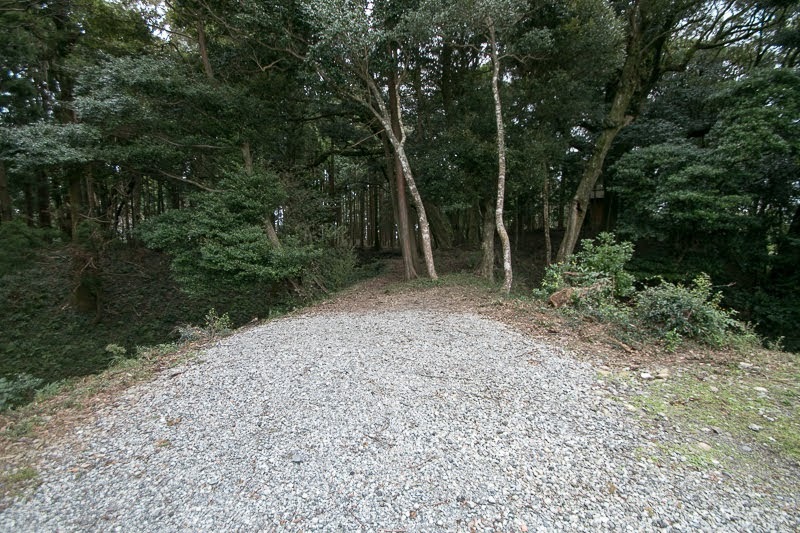 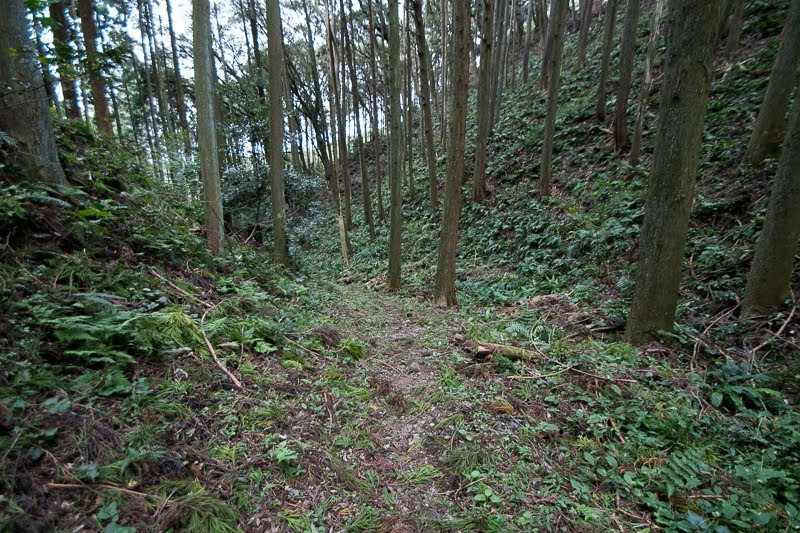 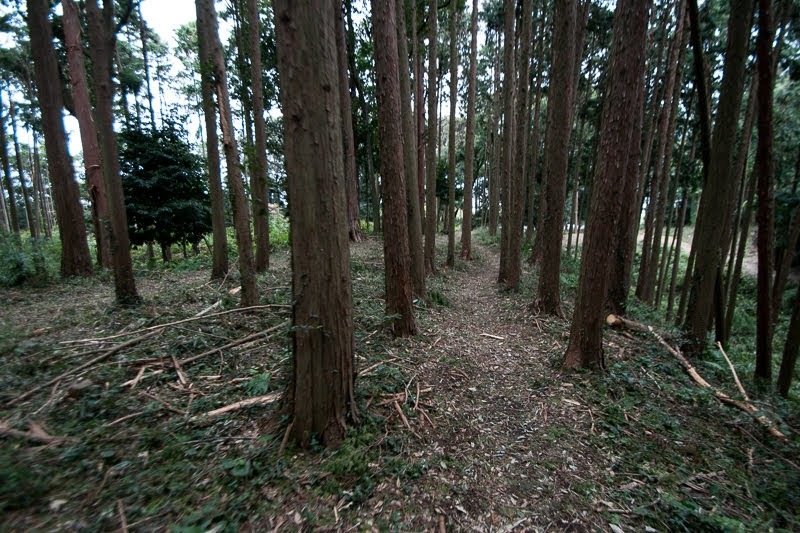 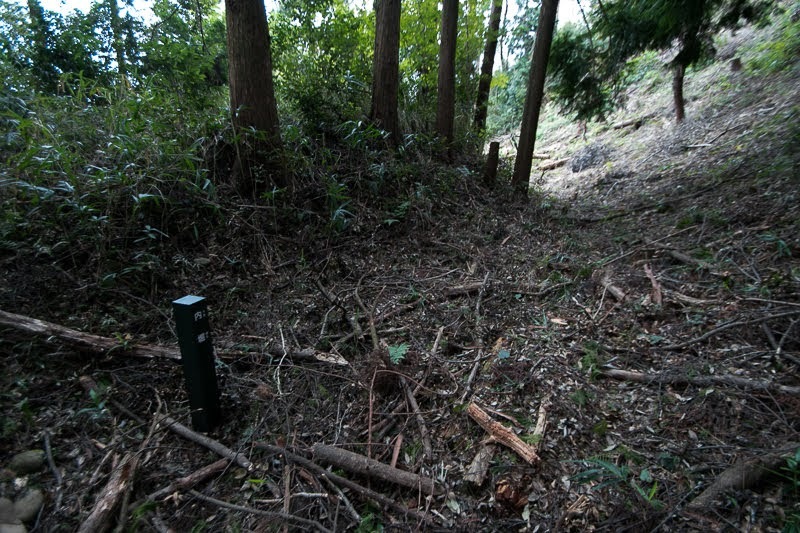 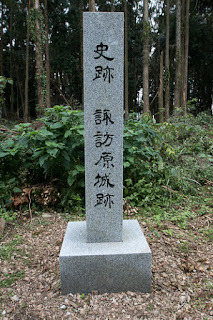 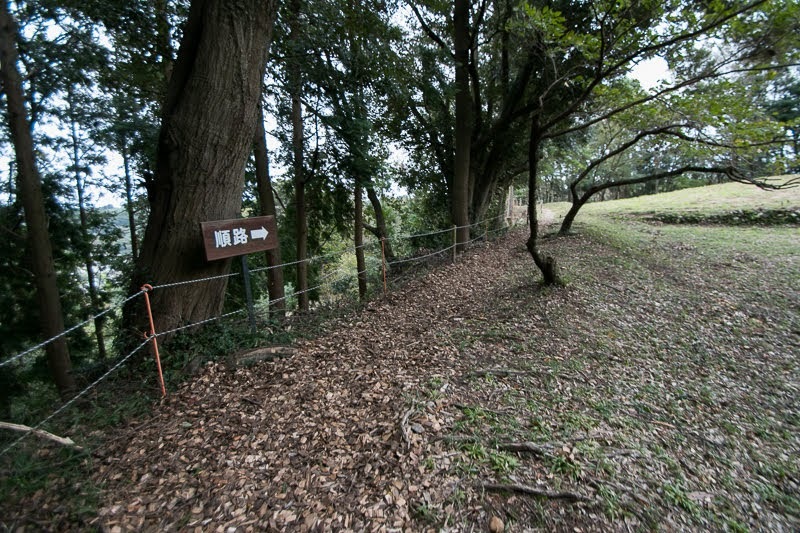 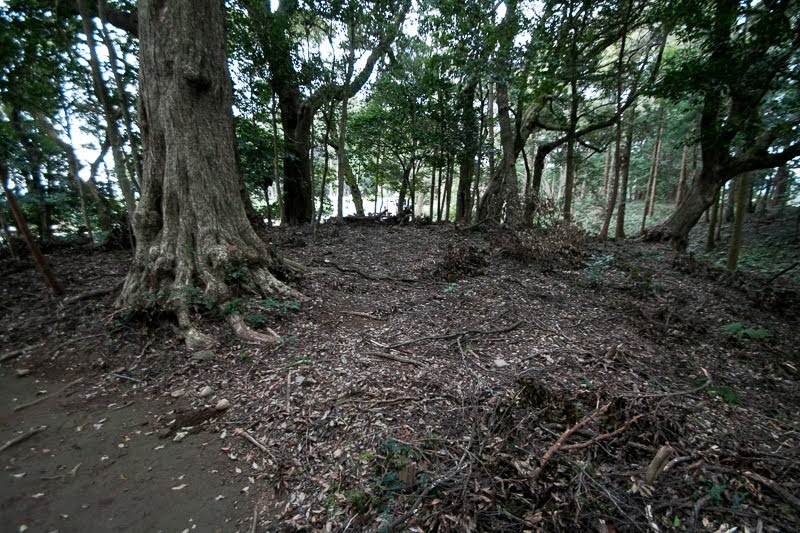 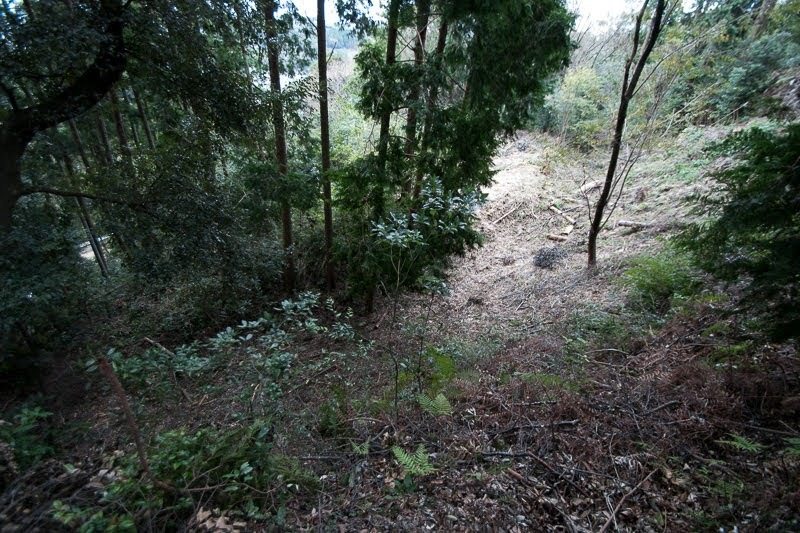 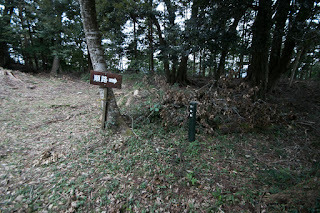 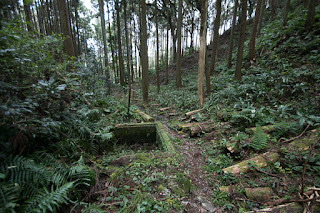 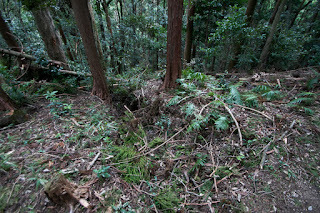 Due to the lack of Suwahara castle, Takeda clan lost military base in this area and main supply line to Takatenjin castle. 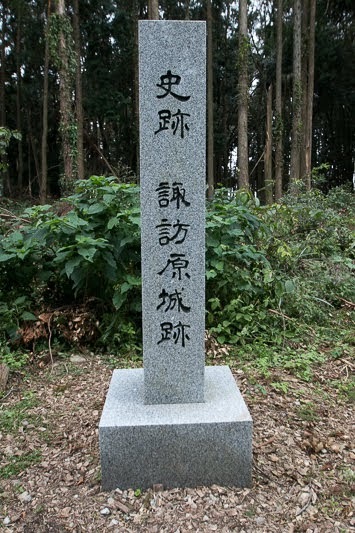 Takeda clan made every effort to bring supplies to Takatenjin castle, but being blocked by encirclement of Tokugawa army, Takagenjin castle finally fell owing to shortage of food in 1581. 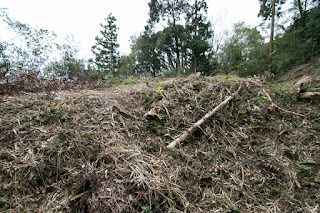 This fall significantly damaged authority of Katsuyori, and lead to sudden corrupt of Takeda clan next year. 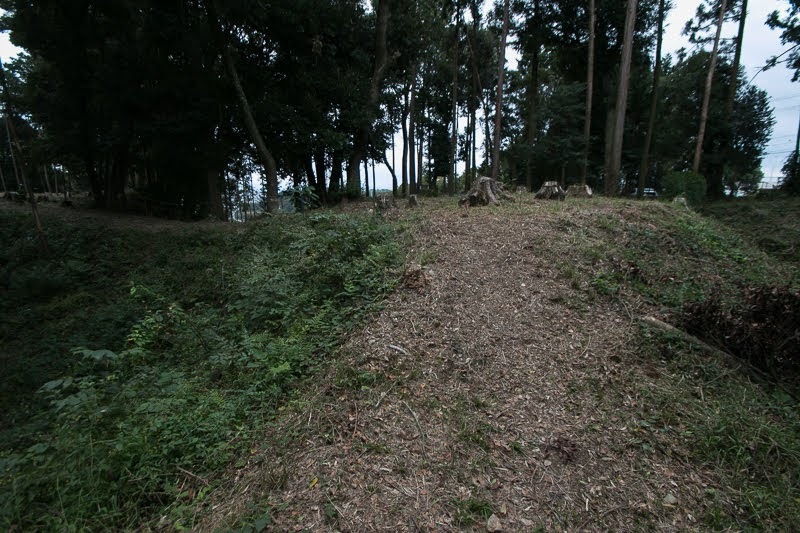 Contrary to this, Tokugawa clan seized Suwahara castle reformed and used as their bridgehead to Suruga province for several years. Attack of Tokugawa clan was obstructed by firm protection of Tanaka castle (Shizuoka prefecture), but finally Tokugawa clan captured Suruga country along with extinction of Takeda clan in 1582, then the role of Suwahara castle became an end. 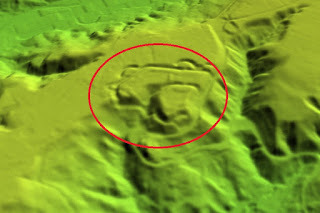 As this castle was newly built and had been used for only less than 10 years, original plan of this castle clearly remains. 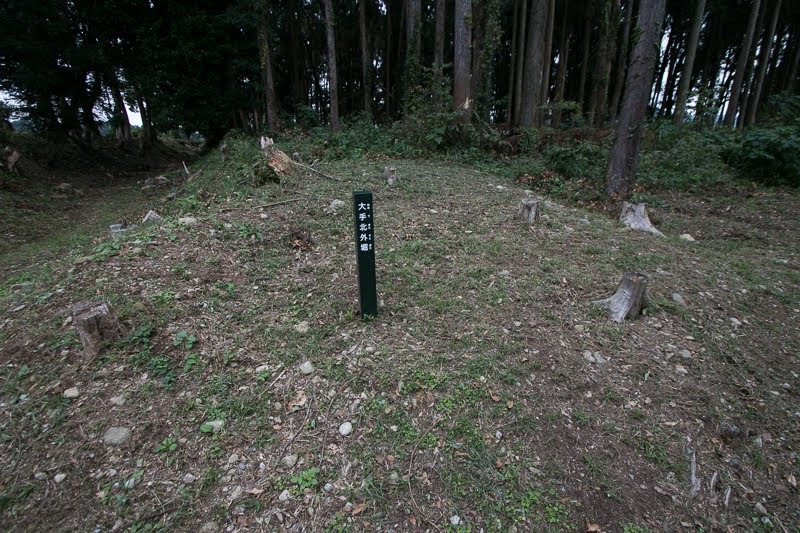 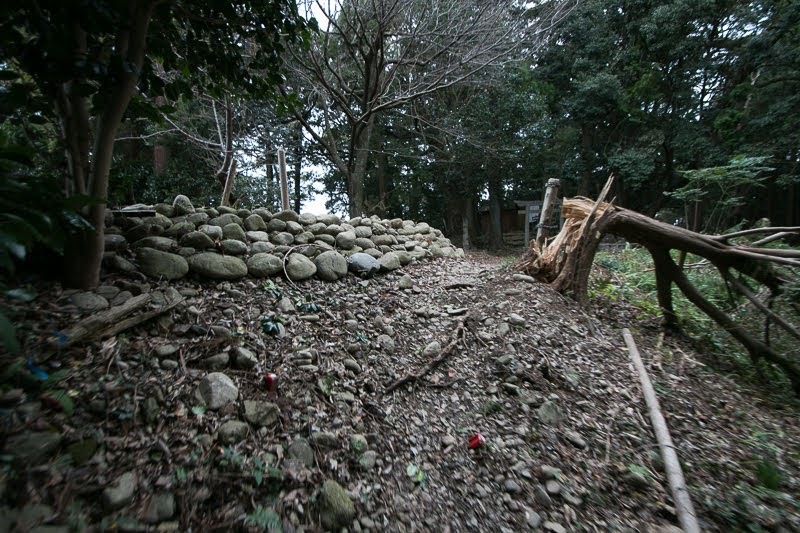 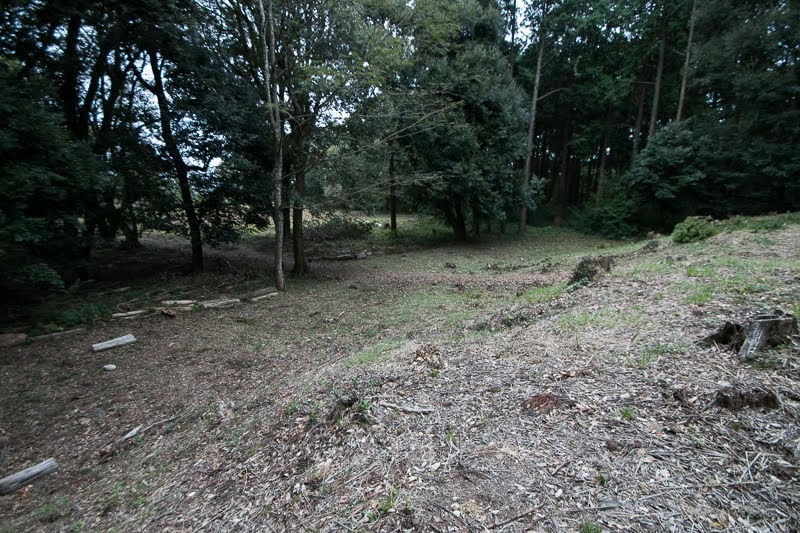 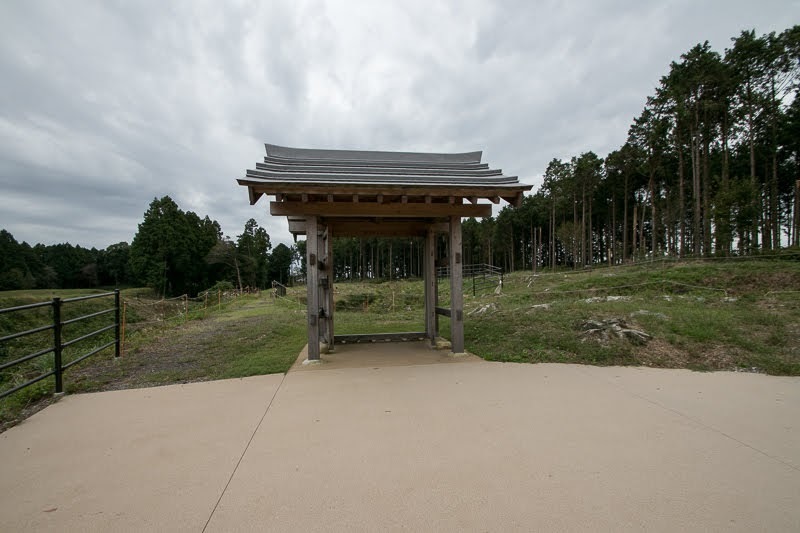 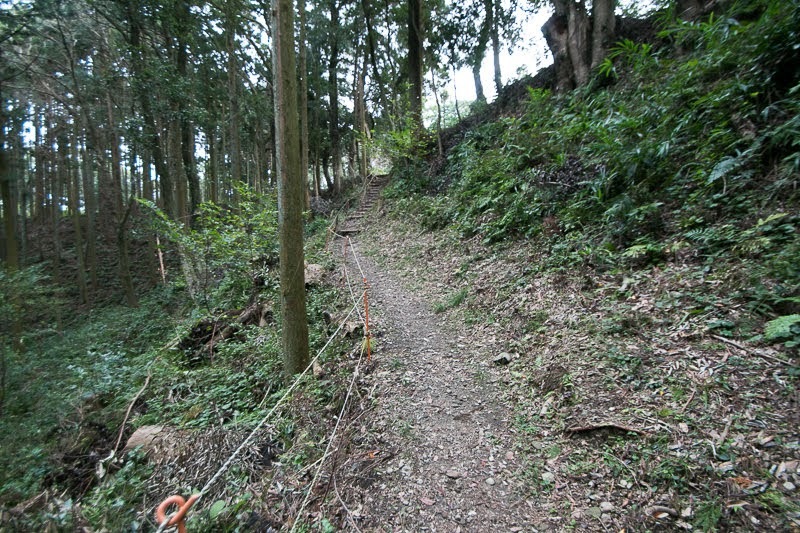 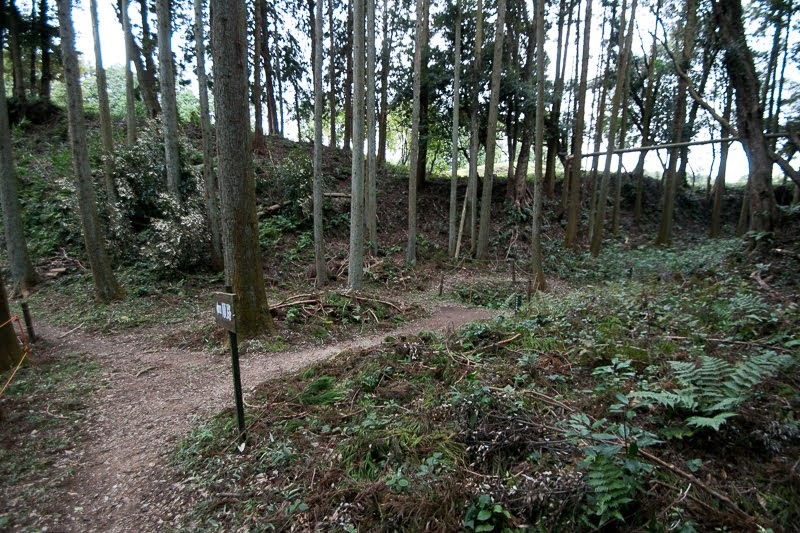 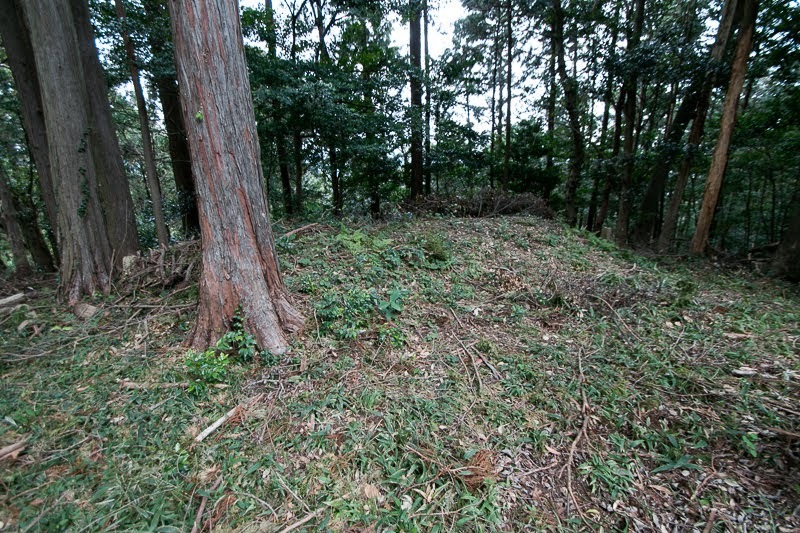 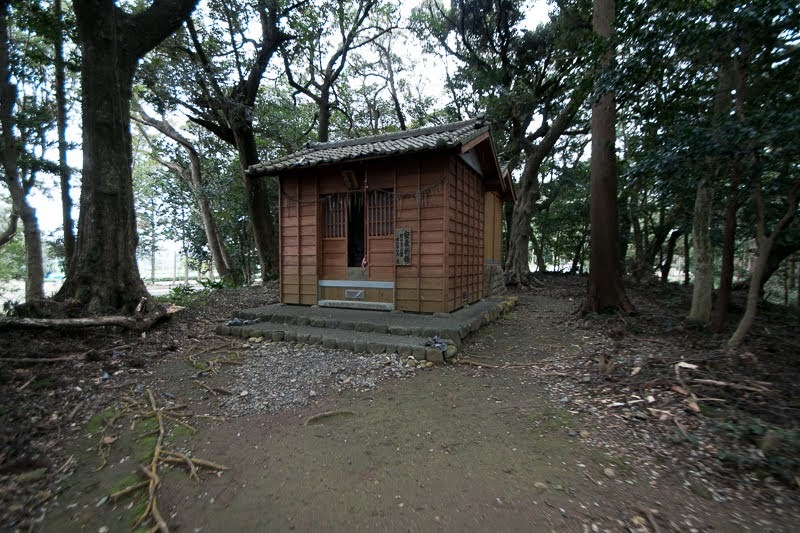 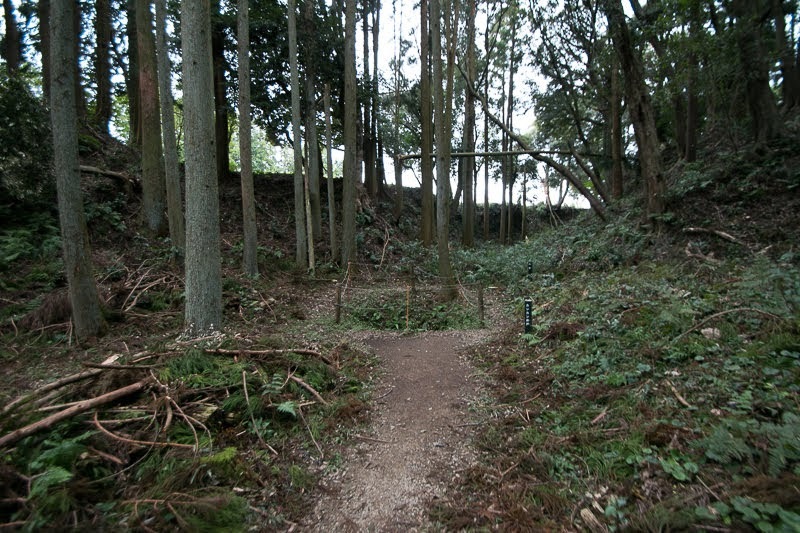 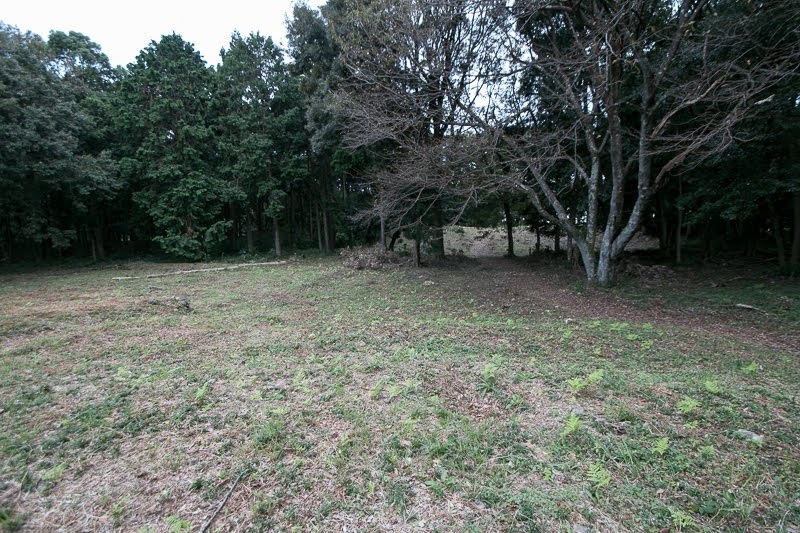 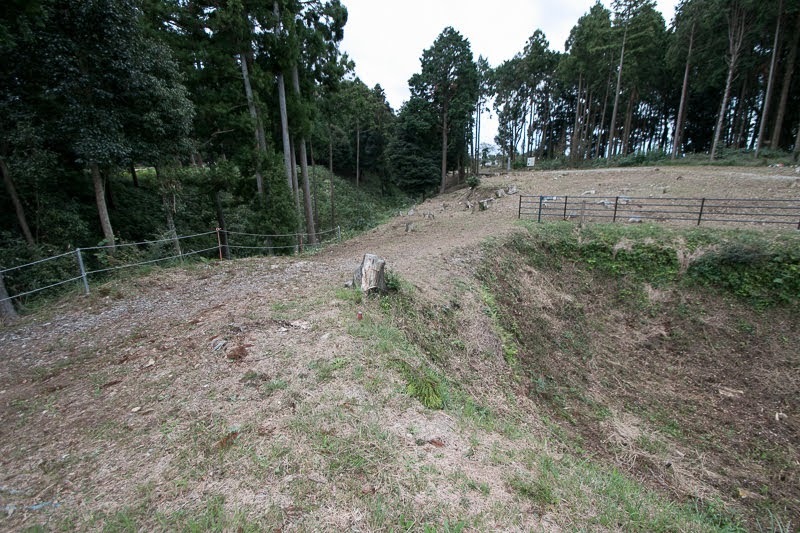 The site of this castle is valuable as this is a typical example of Takeda clan’s castle building features. 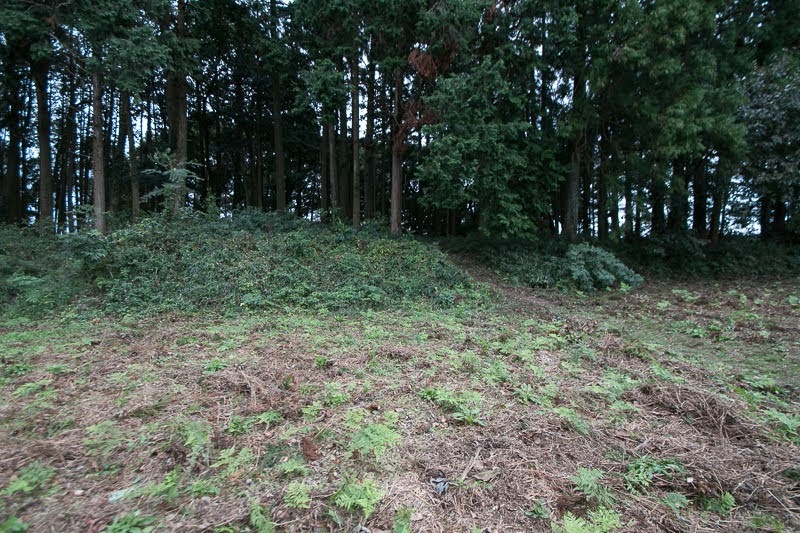 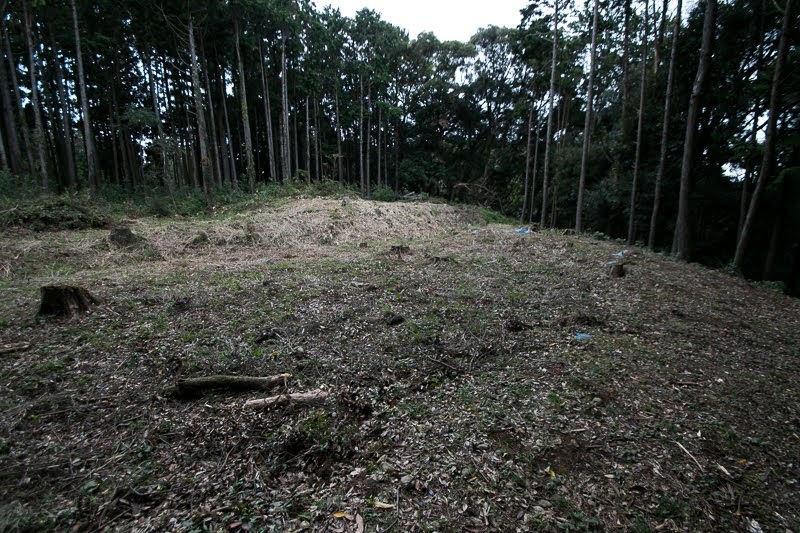 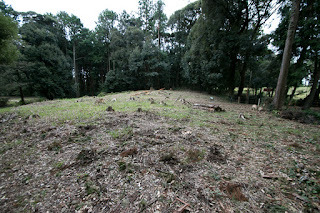 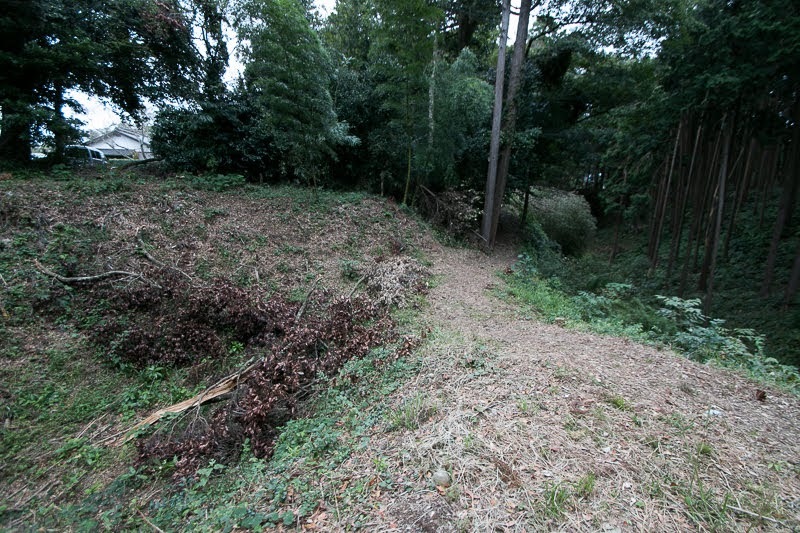 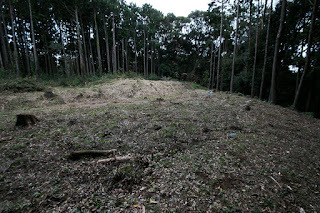 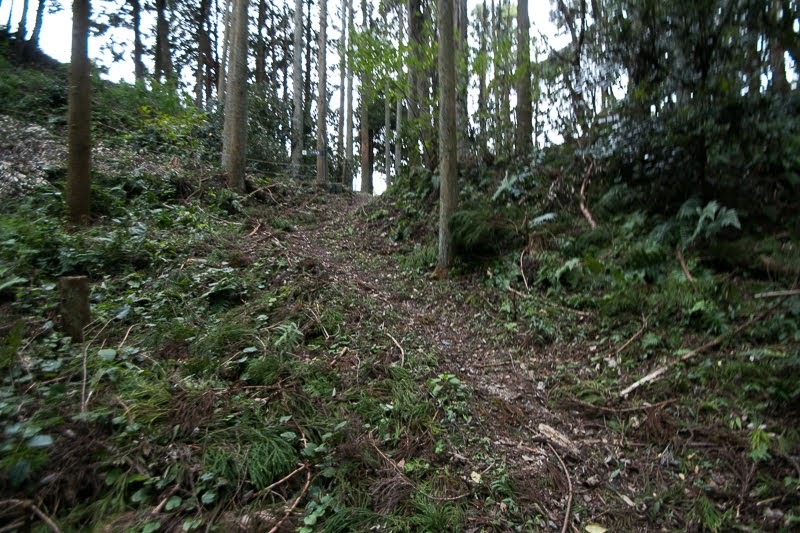 Now castle site is being progressed and it becomes easier to grasp the well though plan of the castle.